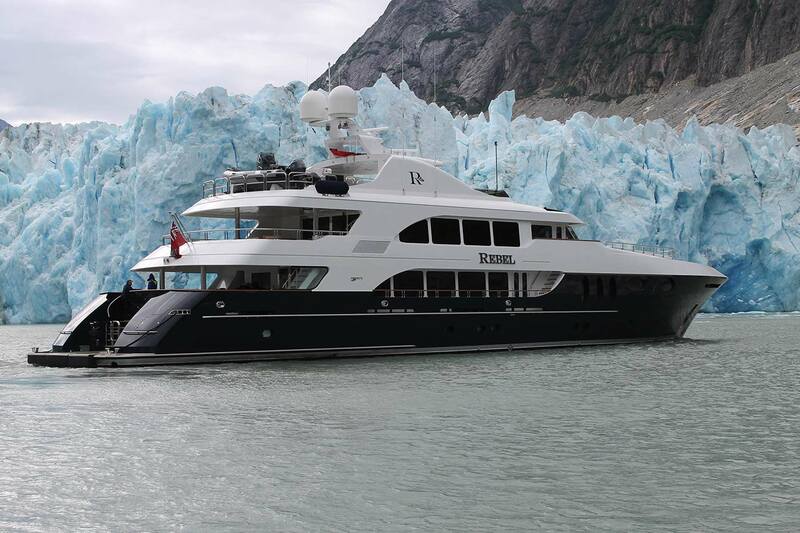 Luxury motor yacht REBEL (ex PERLA BLU, MUSTANG SALLY) is a 157' (47.8m) charter yacht built by Trinity Yachts with an interior by Patrick Knowles. 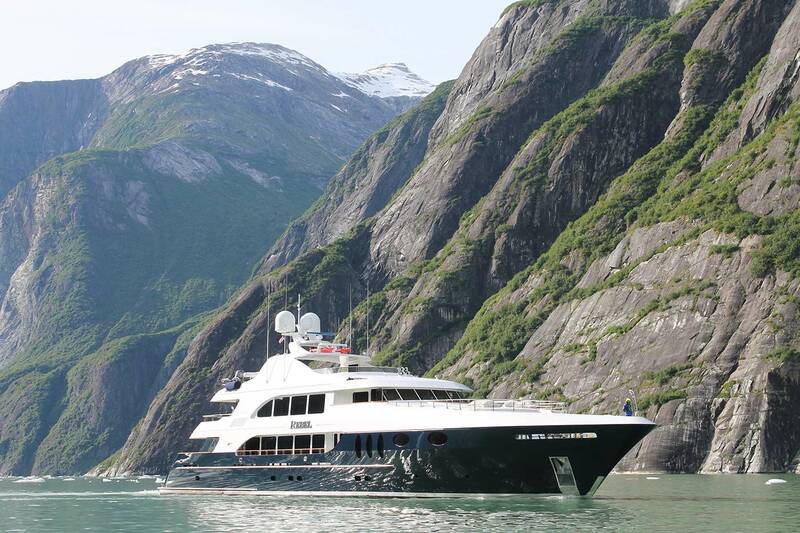 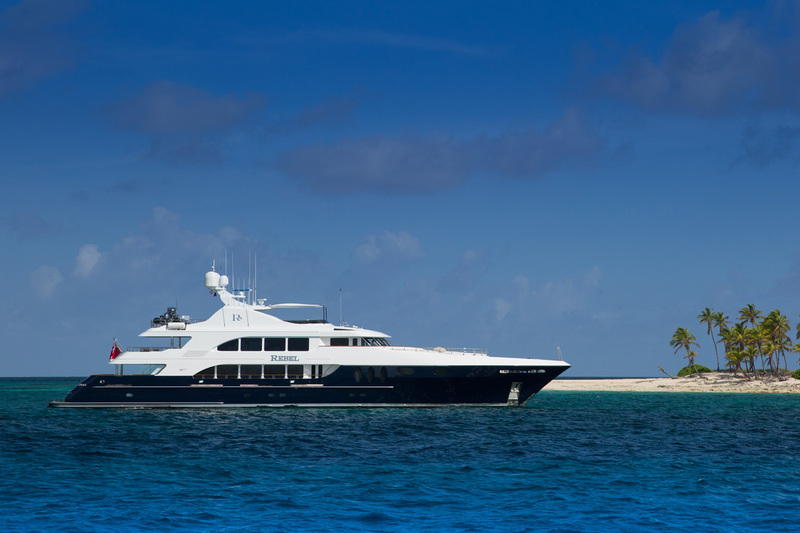 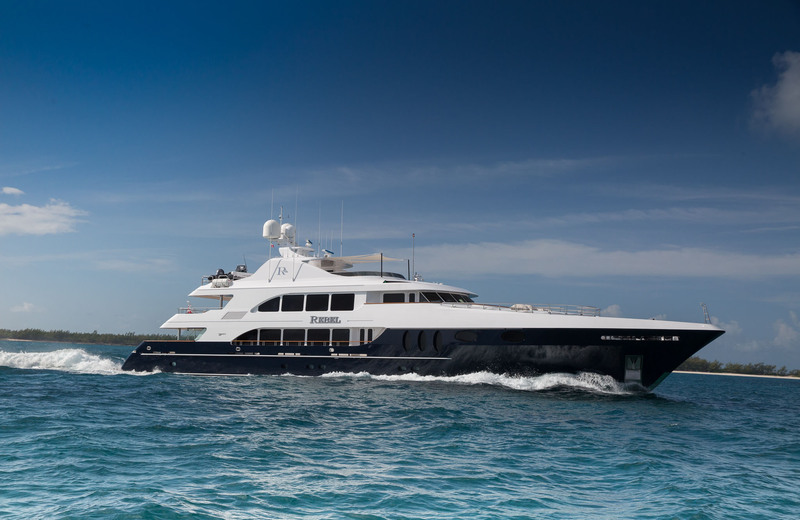 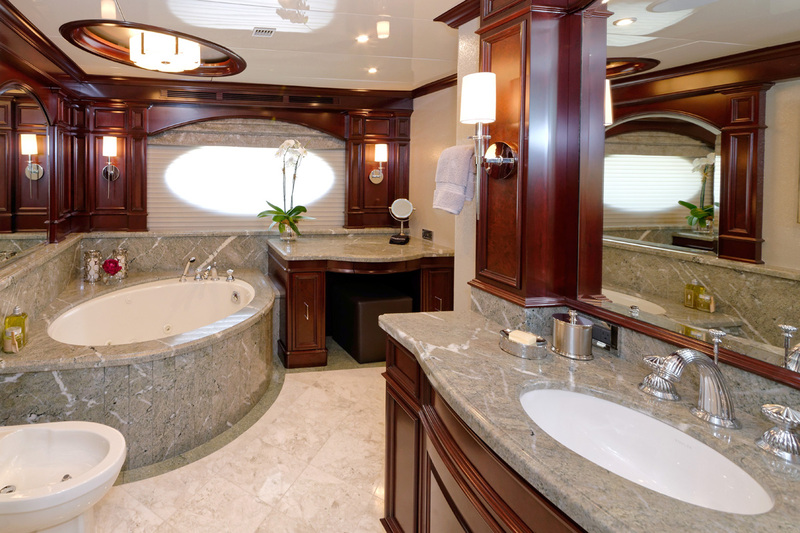 M/Y REBEL was launched in 2005 and accordingly has many contemporary design features and amenities. 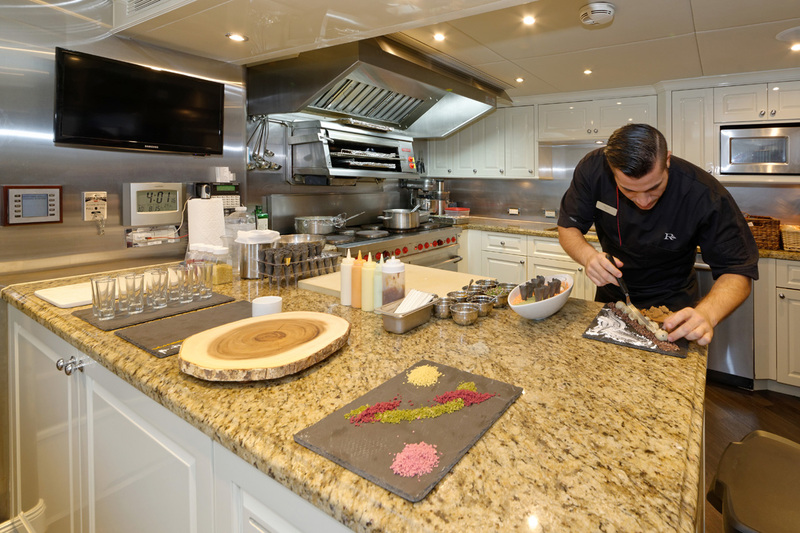 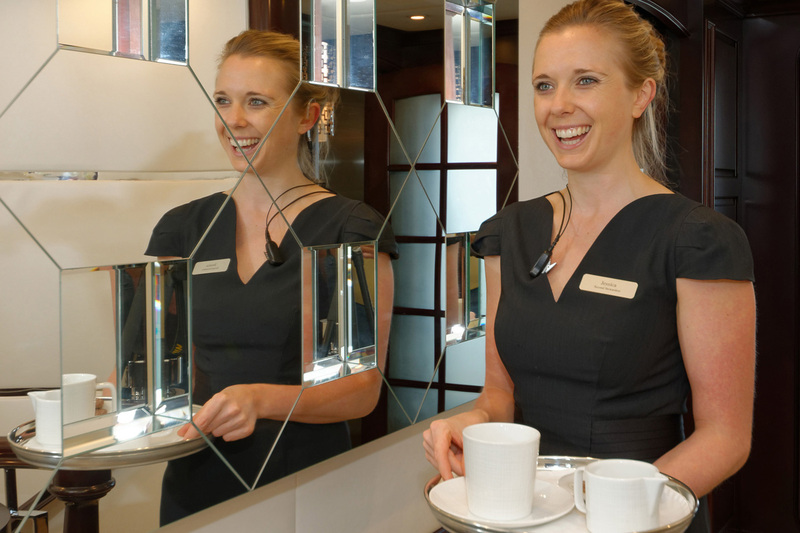 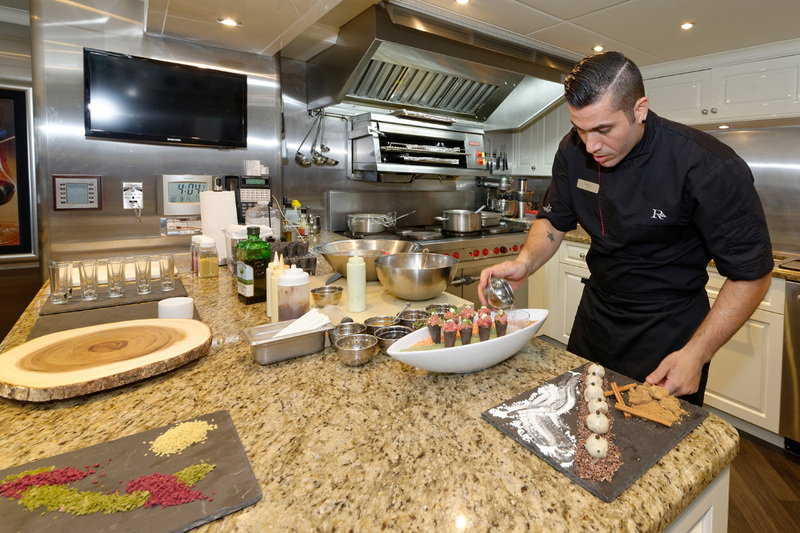 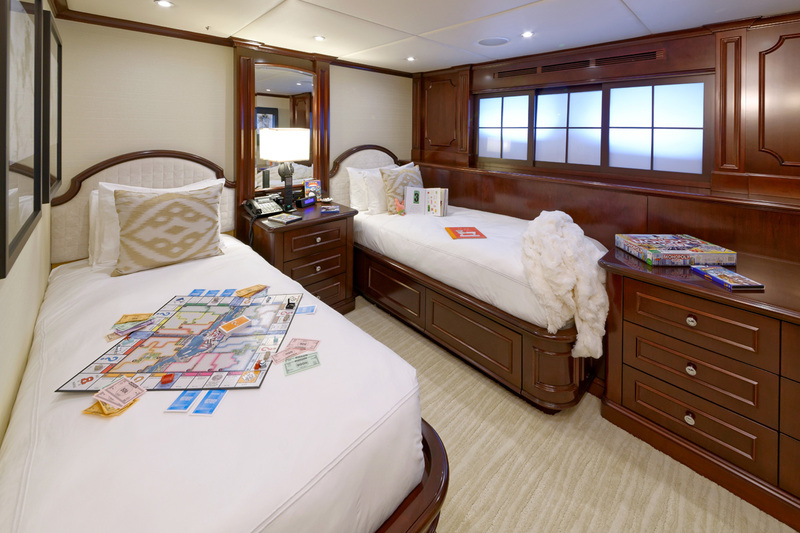 She underwent an extensive refit in 2015 and is able to accommodate 10 guests in 5 cabins. 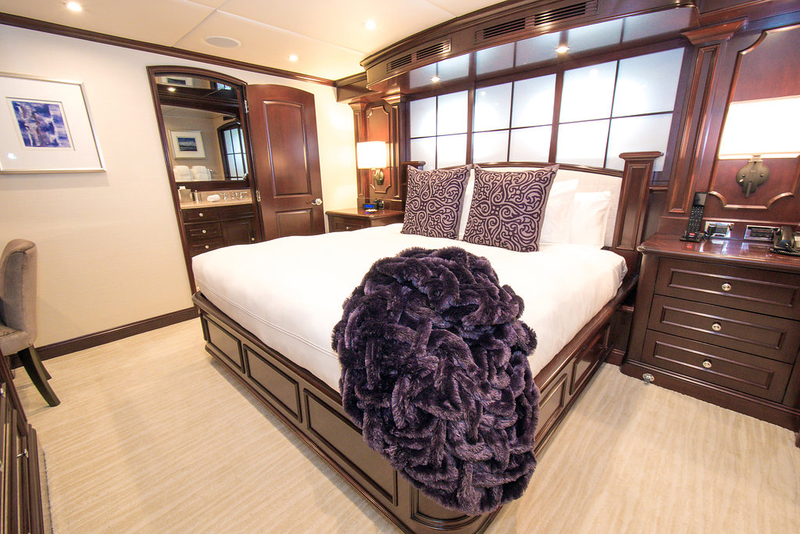 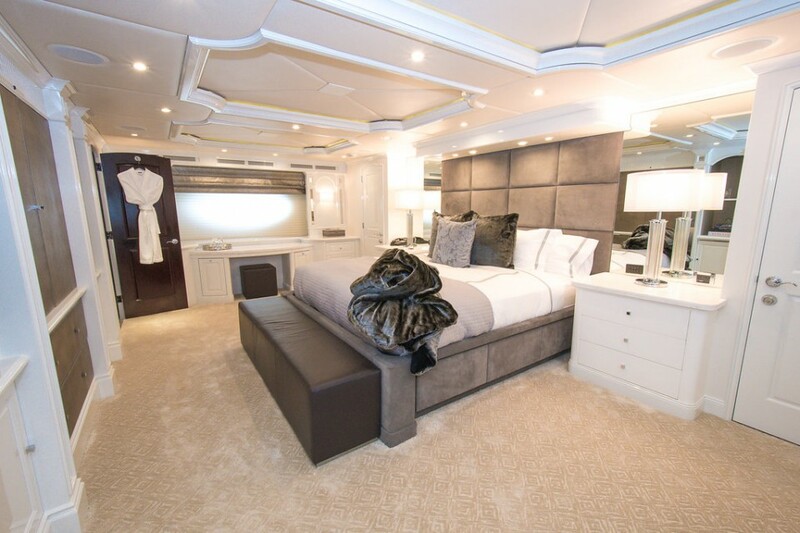 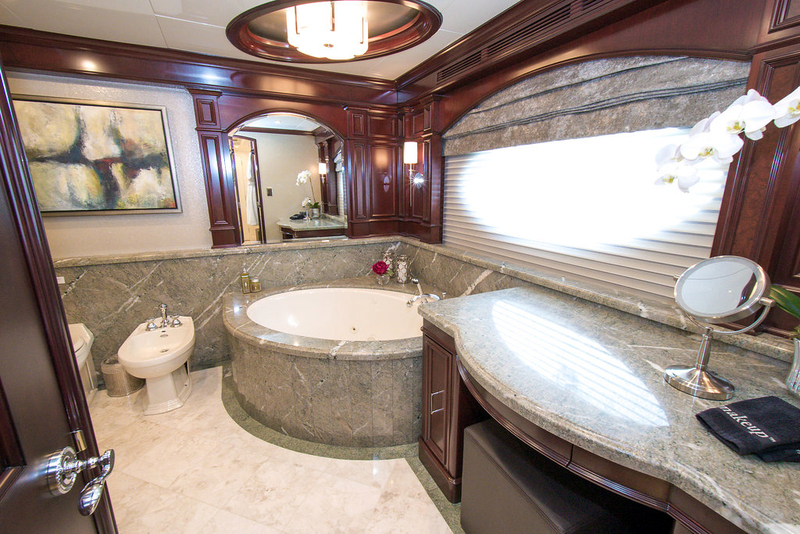 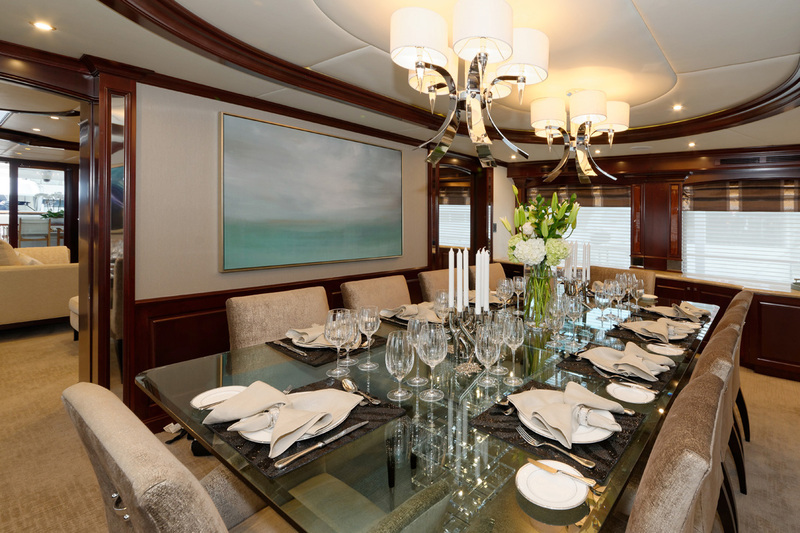 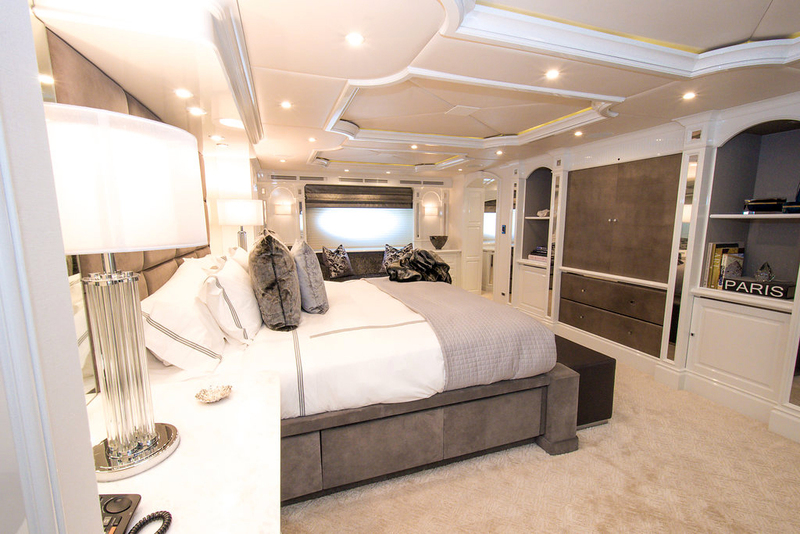 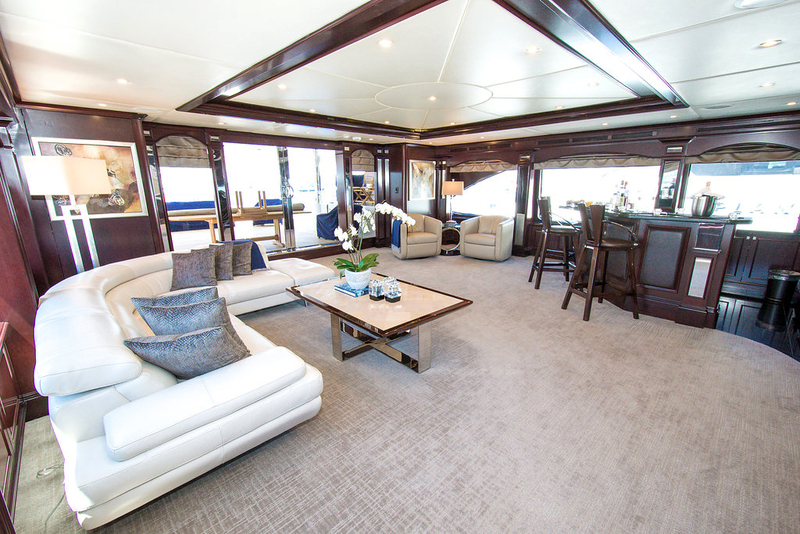 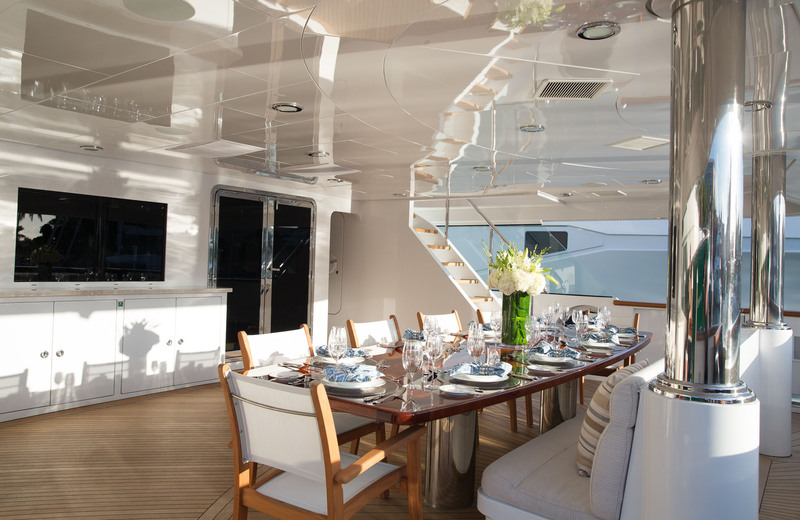 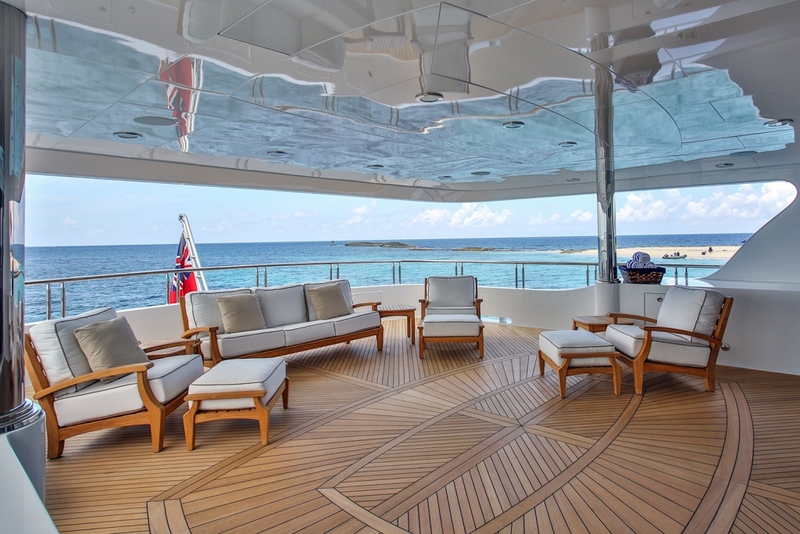 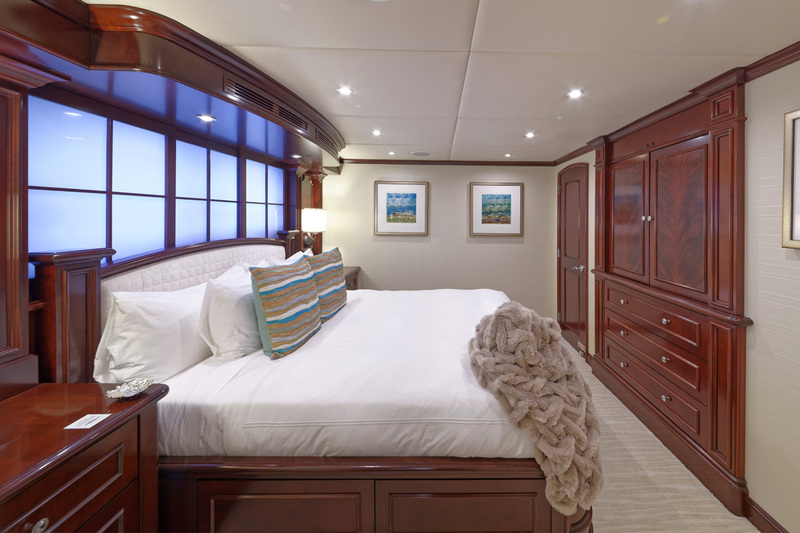 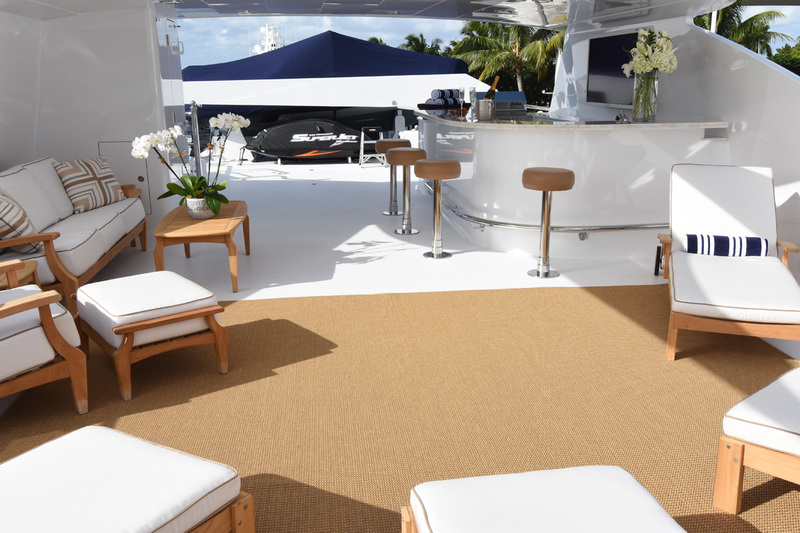 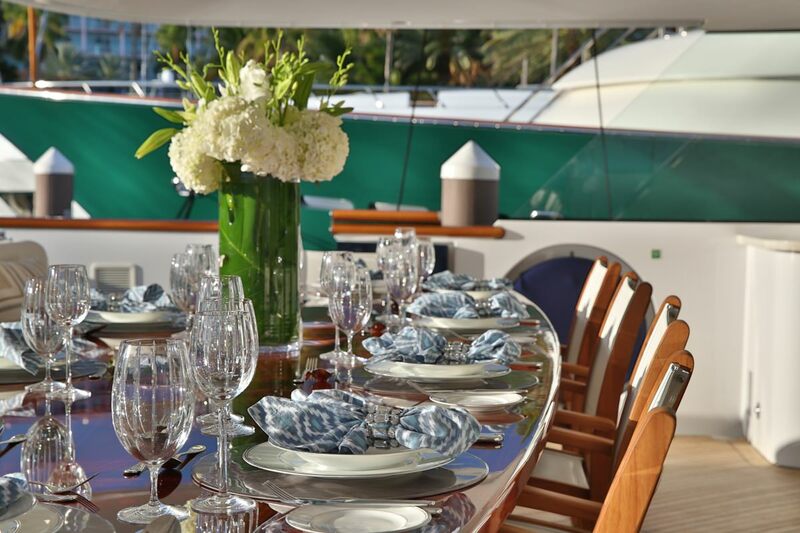 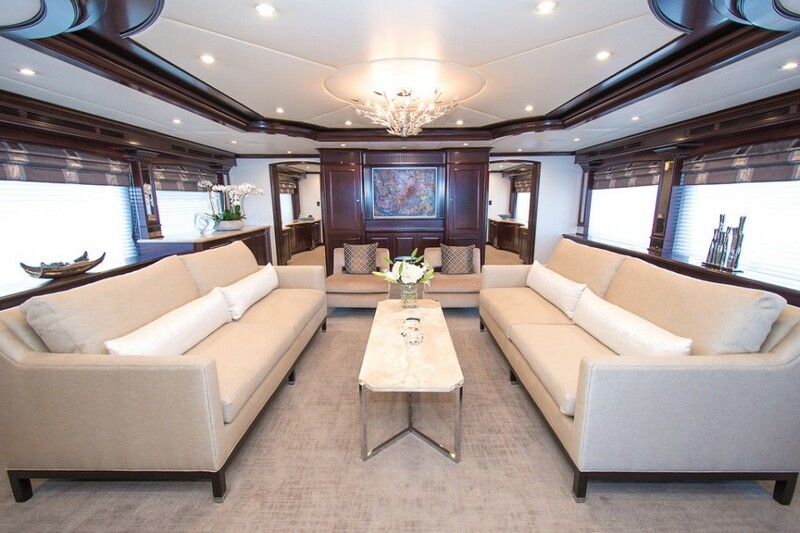 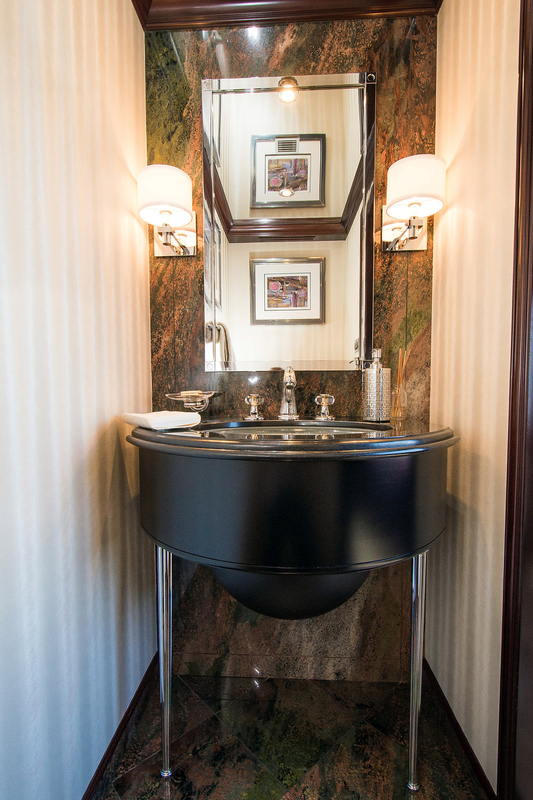 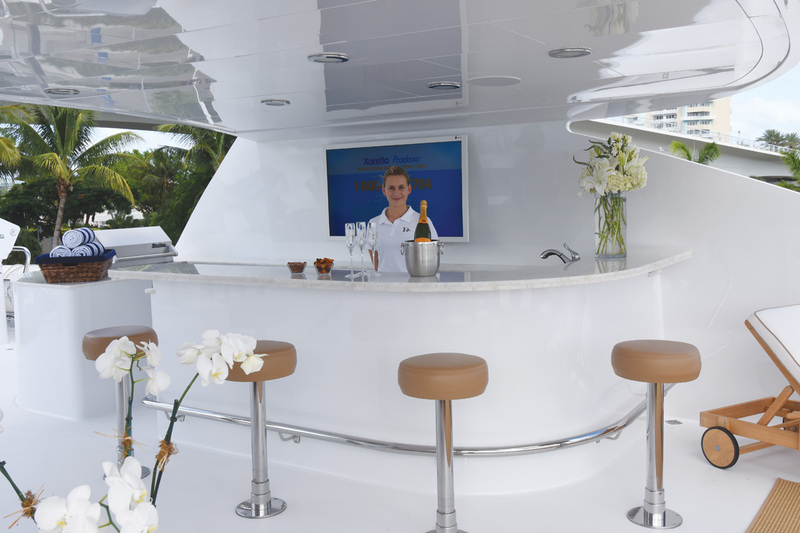 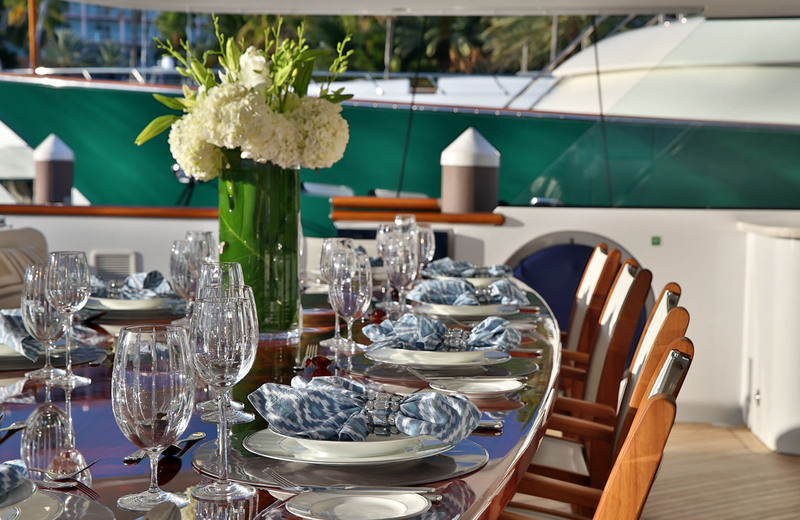 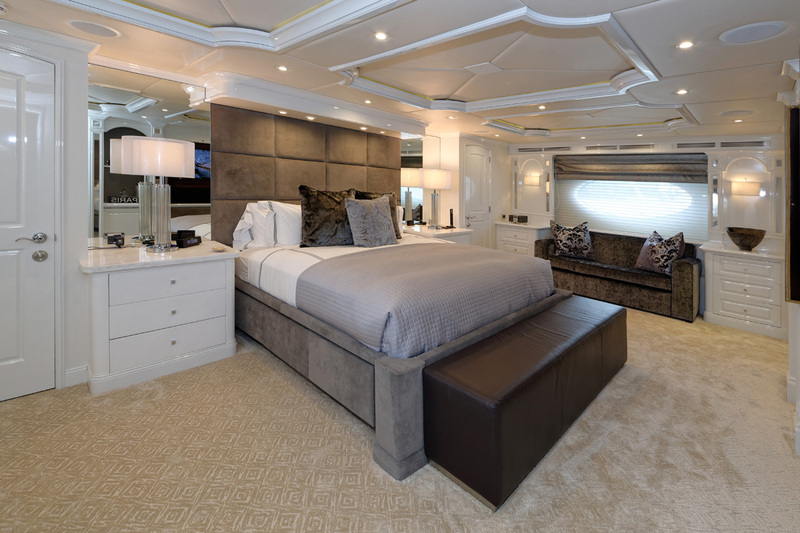 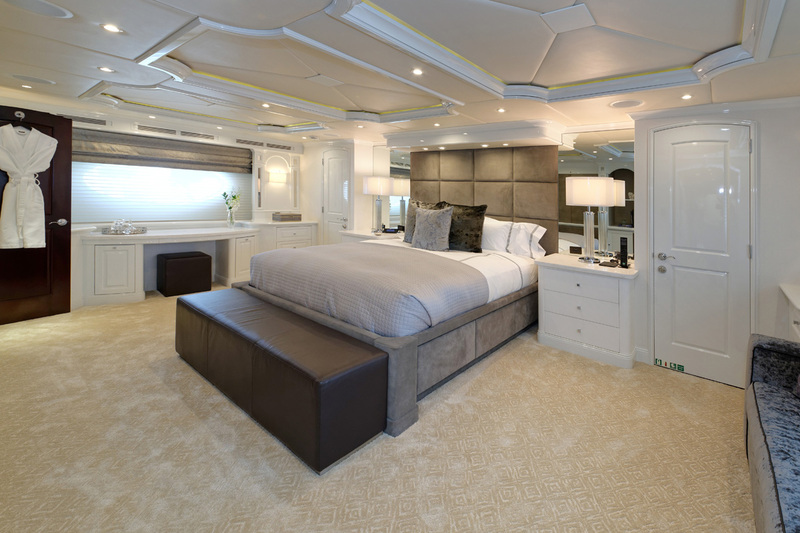 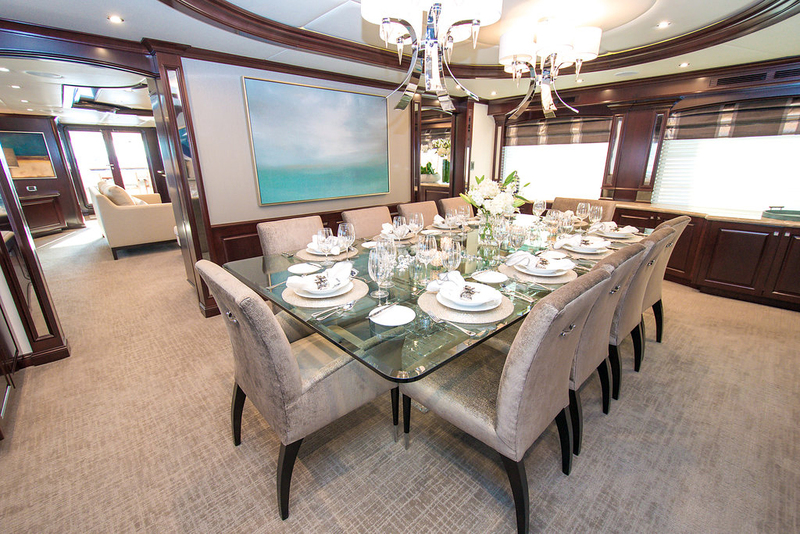 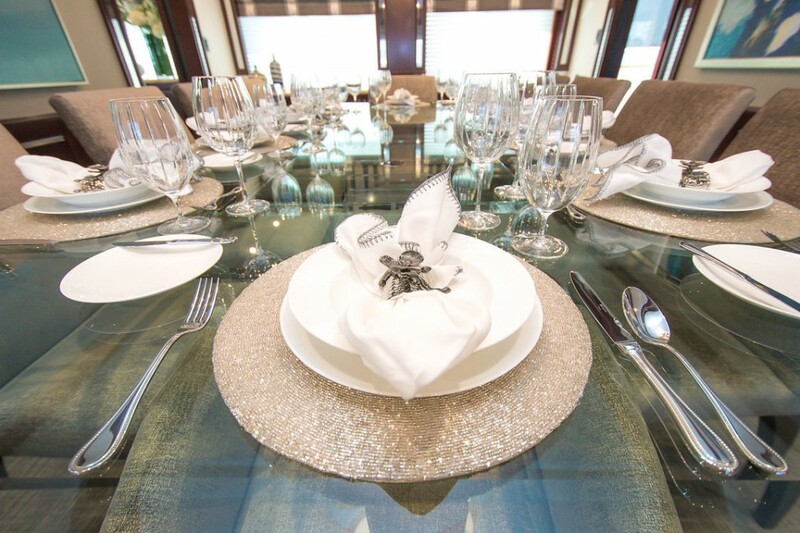 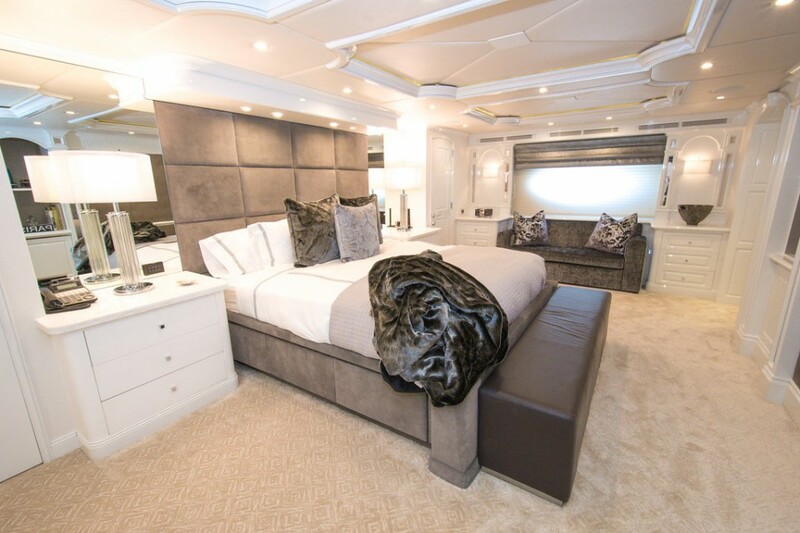 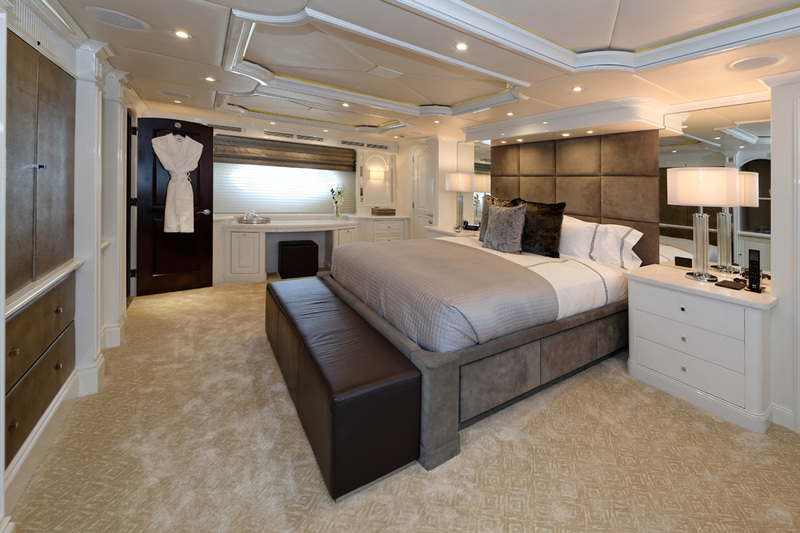 Motor yacht REBEL offers a timeless elegant interior décor. 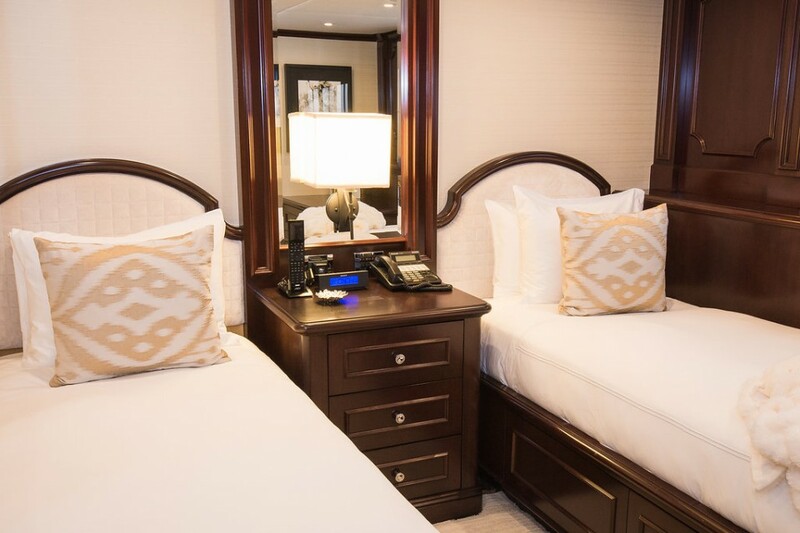 Rich woods, plush neutral furnishings and exquisite finishes have created a truly relaxing and inviting ambience throughout. 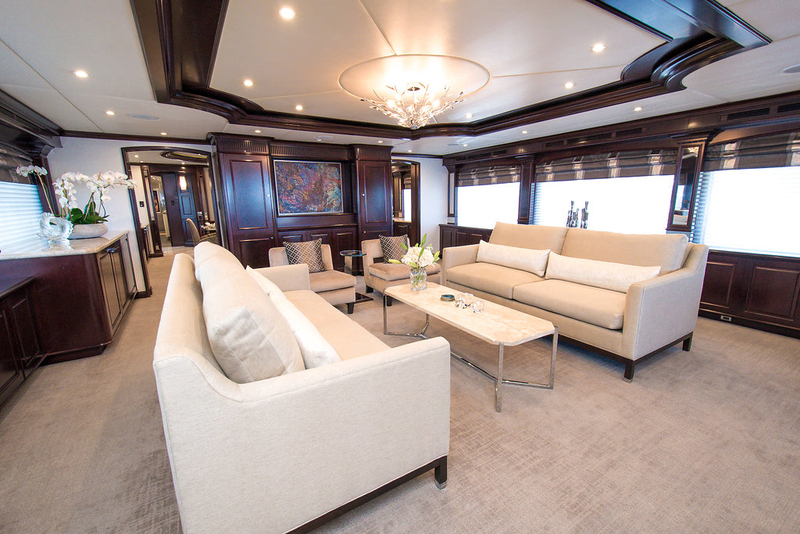 The main salon offers 2 opposing sofas, occasional chairs, a coffee table and full entertainment systems, perfect for entertaining and socializing. 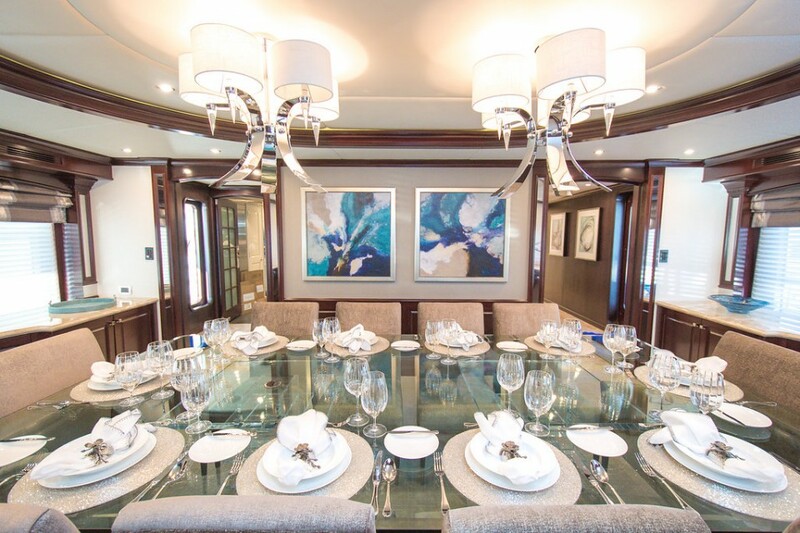 Forward and separate is the formal dining table, flanked in high back chairs, offering a sophisticated atmosphere. 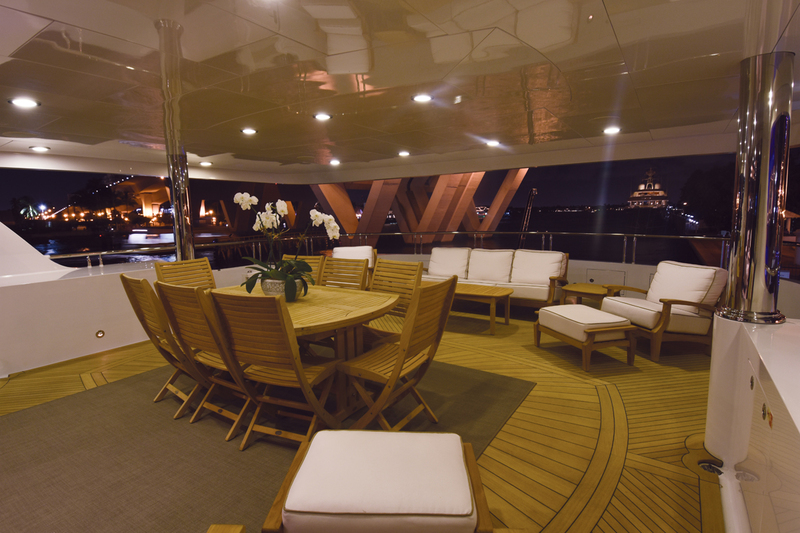 On the main deck forward is the full beam master cabin. 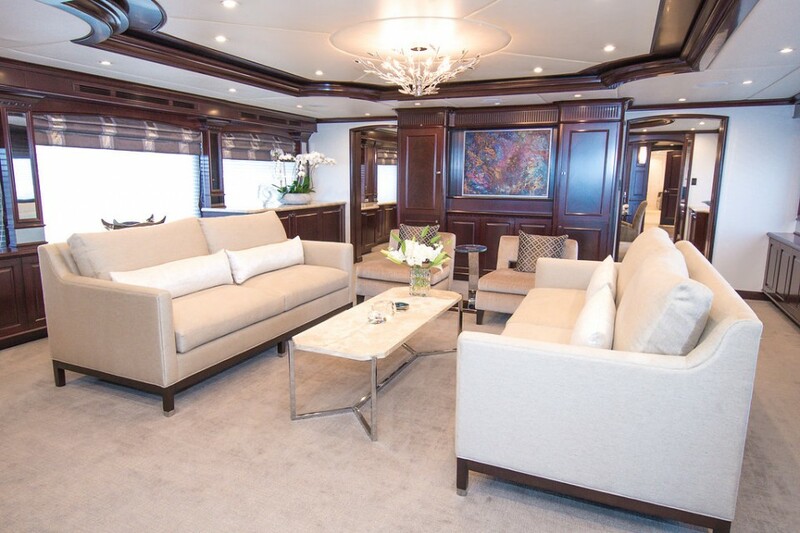 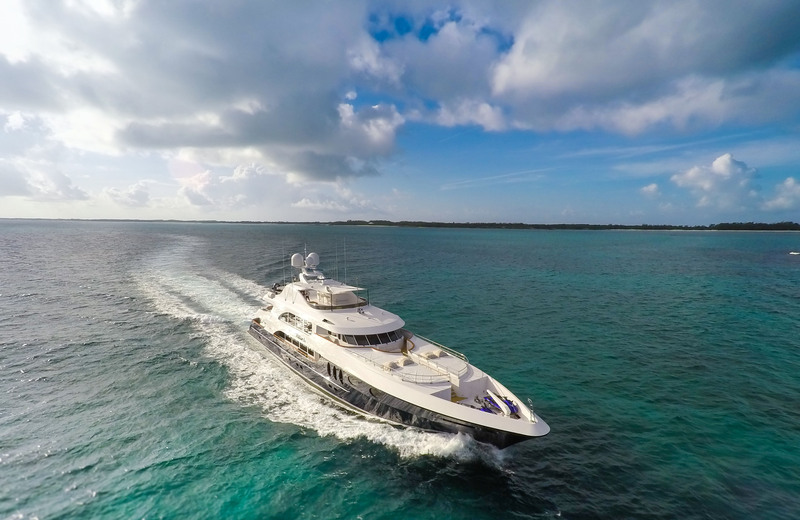 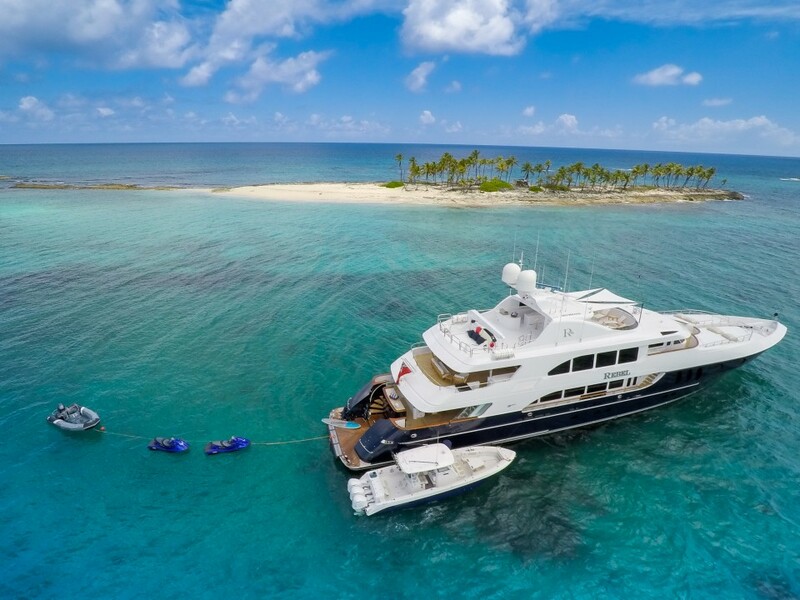 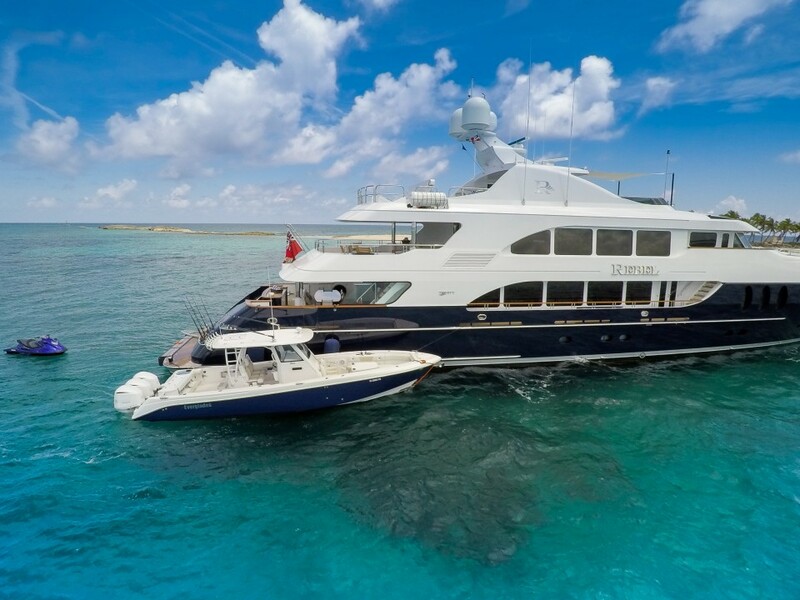 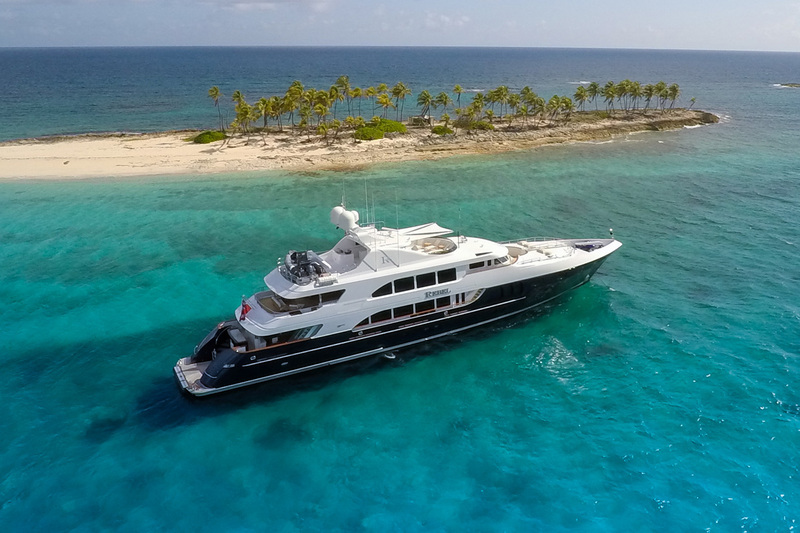 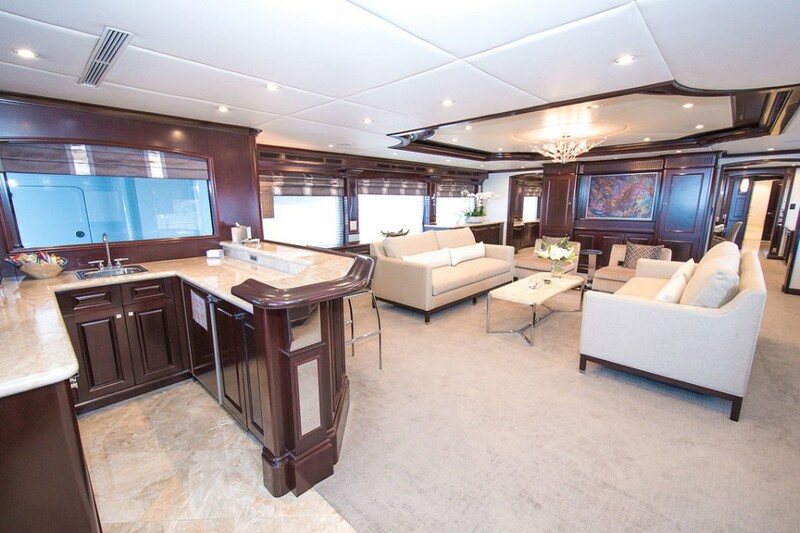 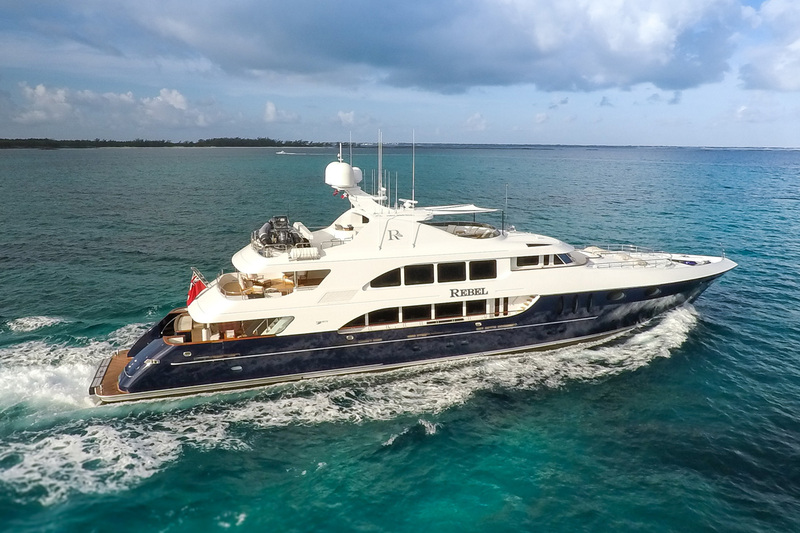 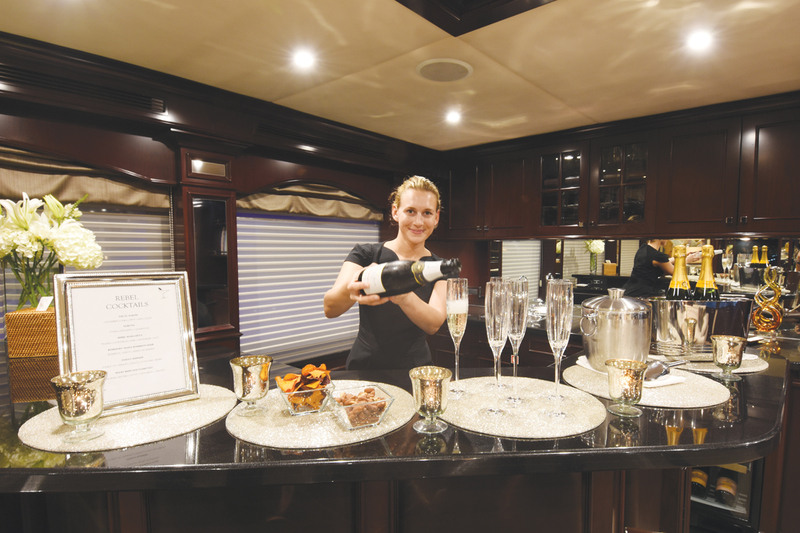 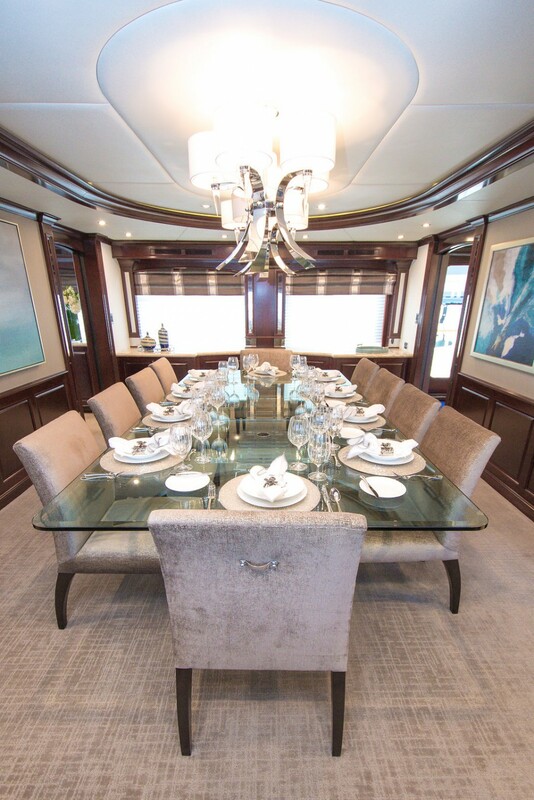 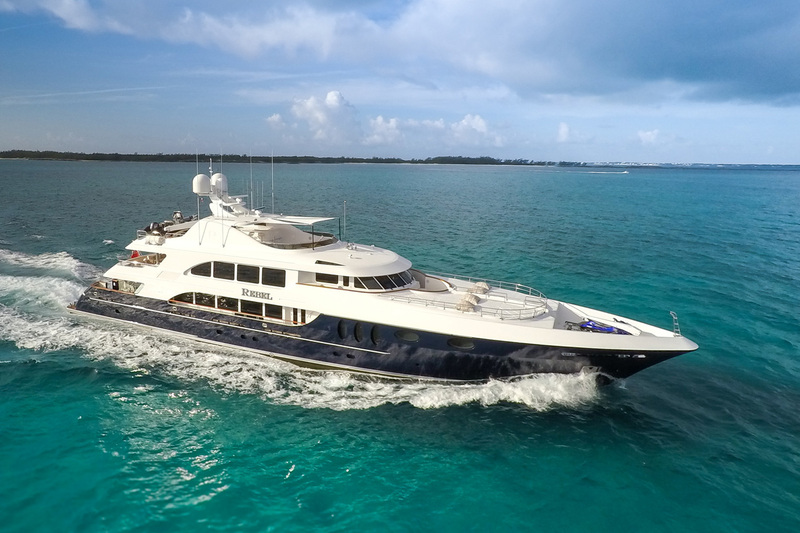 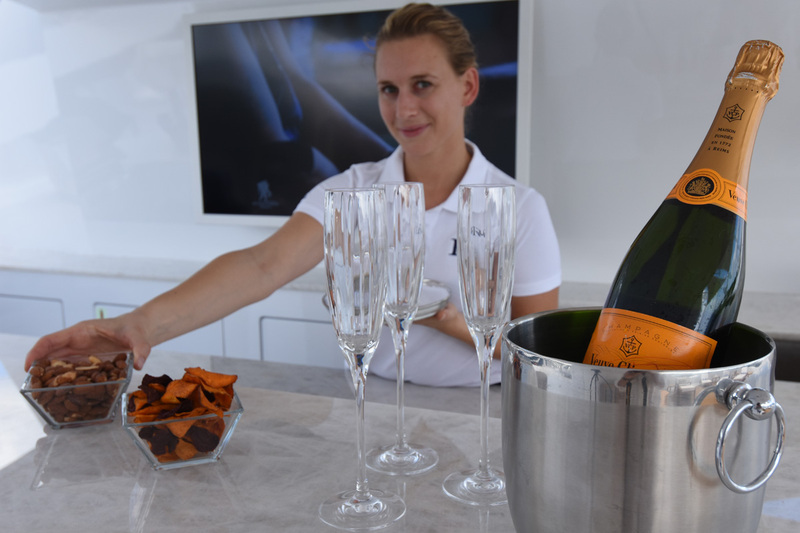 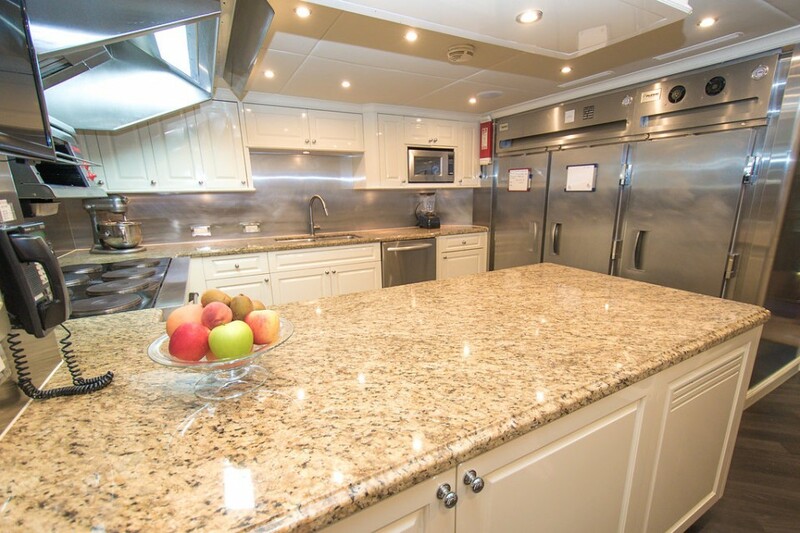 An upper salon aboard the Trinity motor yacht REBEL is well-appointed, boasting a large sofa, occasional chairs, complete wet bar and full entertainment systems. 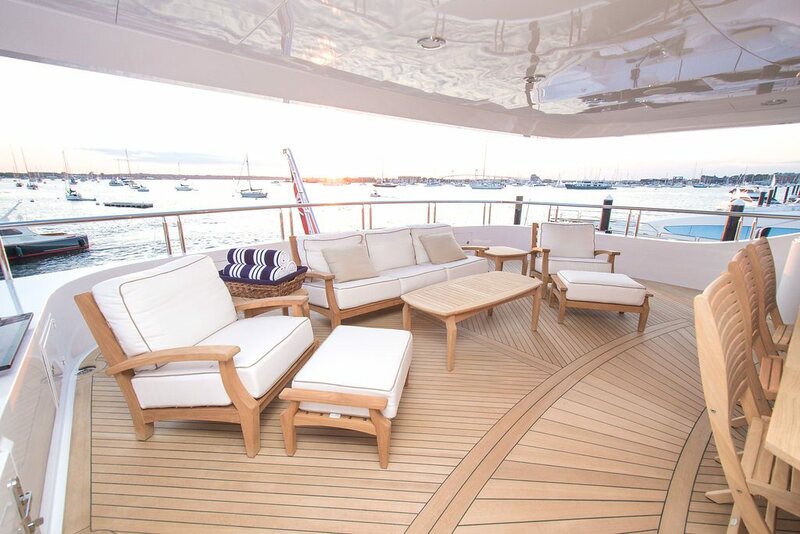 The social interior areas feature large panoramic windows for spectacular views and plenty of natural light. 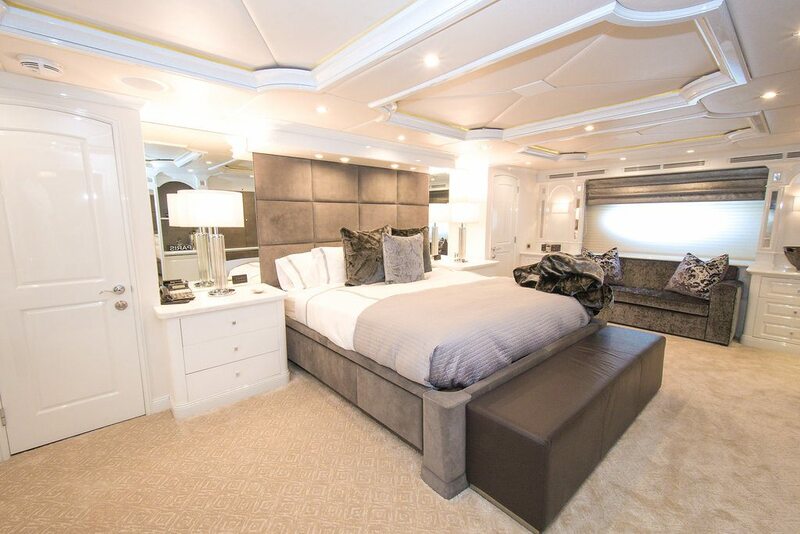 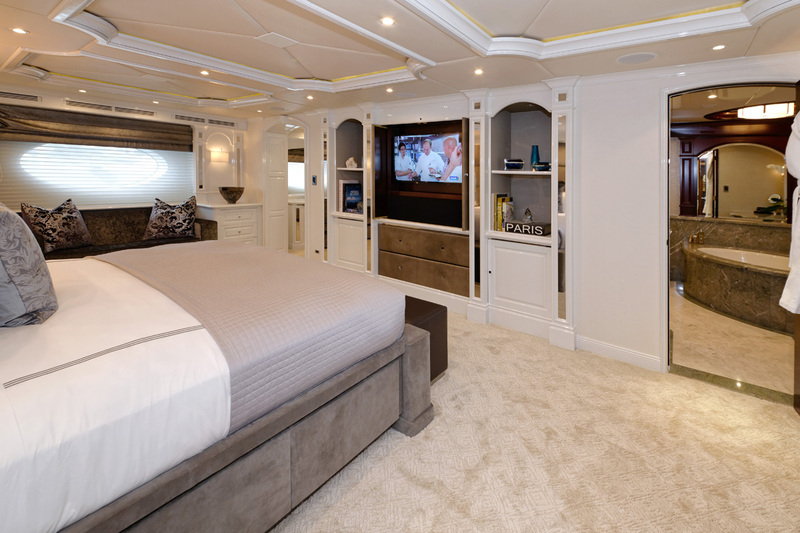 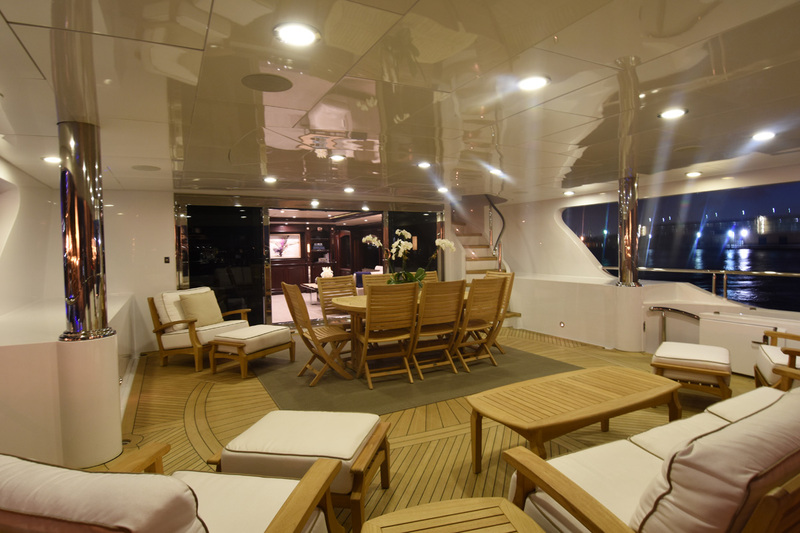 On the lower deck are a further 4 guest cabins, all finished to the high standard seen throughout the yacht. 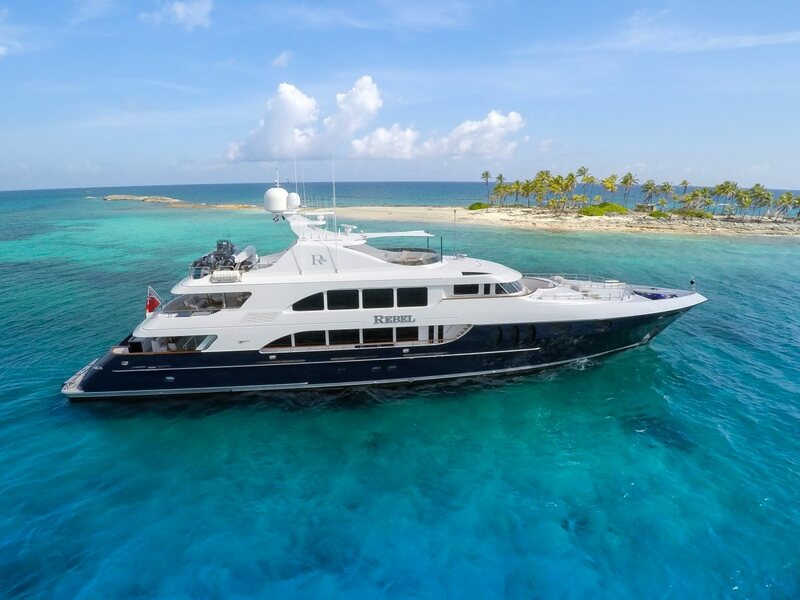 Exterior living is capacious on M/Y REBEL, she features 3 impressive decks and an abundance of space to relax, entertain and enjoy. 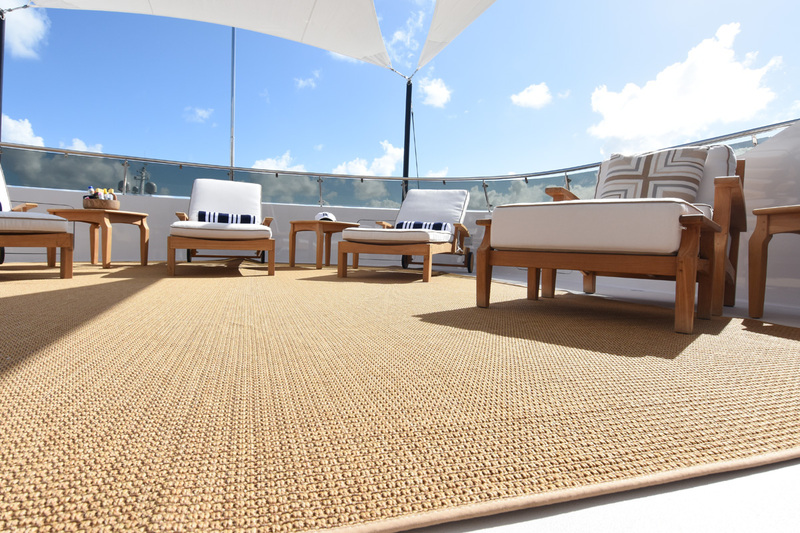 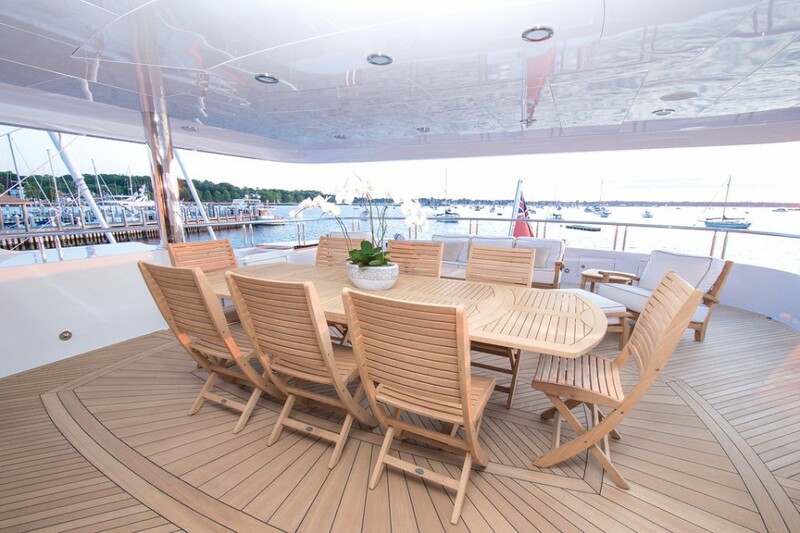 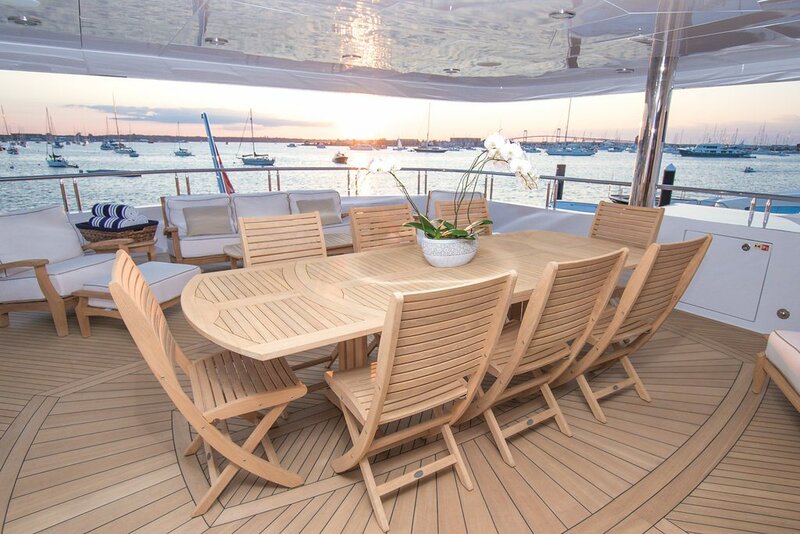 The aft deck is shaded and adjacent to the salon, offering an alfresco dining table and comfortable seating. 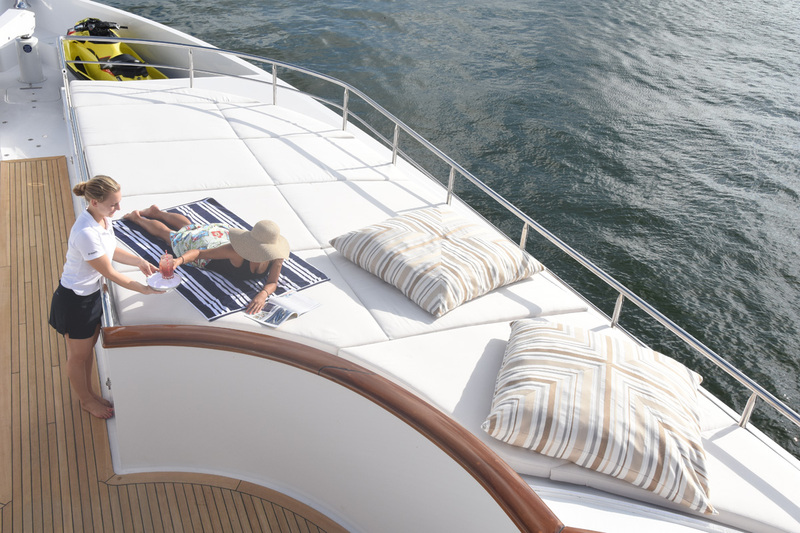 Dual steps lead on port and starboard to the extended swim platform and water toys garage, perfect for those wishing to effortlessly make the most of the good array of the water toys available. 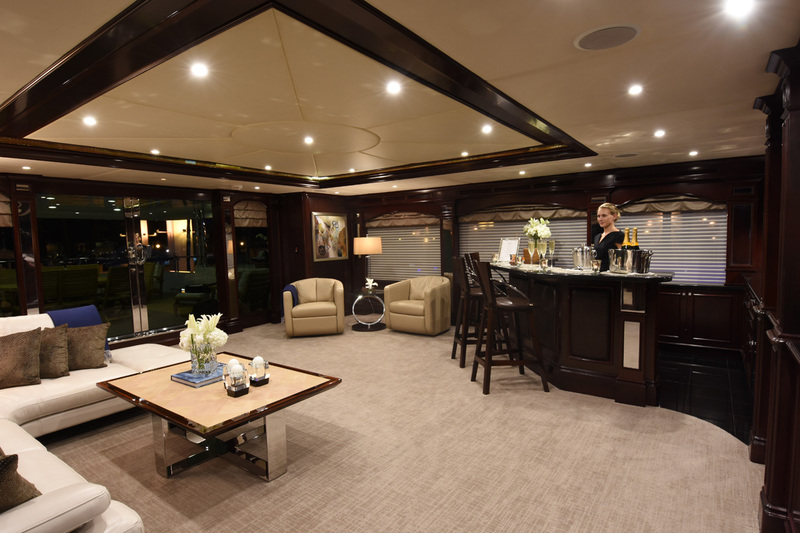 The upper deck features a partially shaded area with direct access to the upper salon, here an exterior lounge invites guests to relax in style. 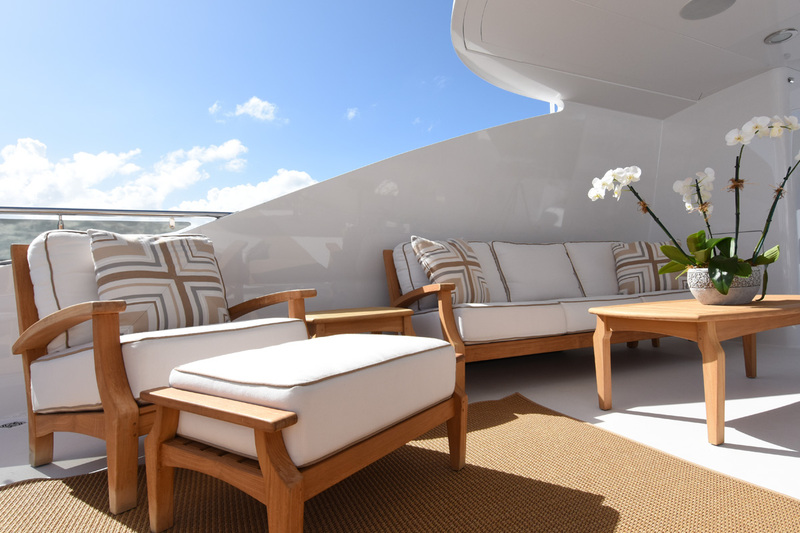 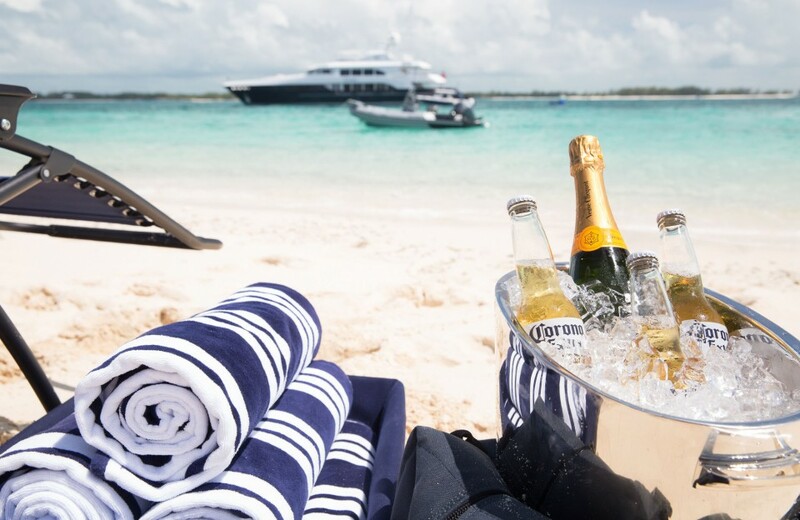 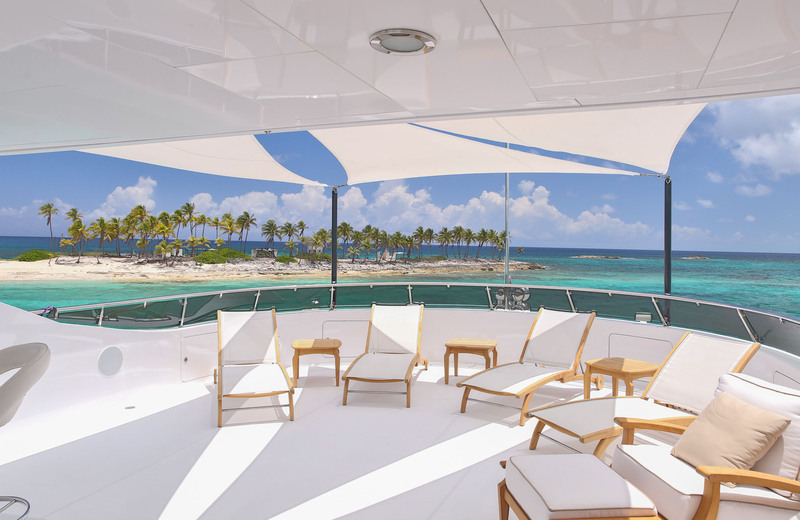 Motor yacht REBEL’s top deck is a sunlovers paradise, complete with chaise lounges, optional shade, wet bar with seating and full entertainment systems. 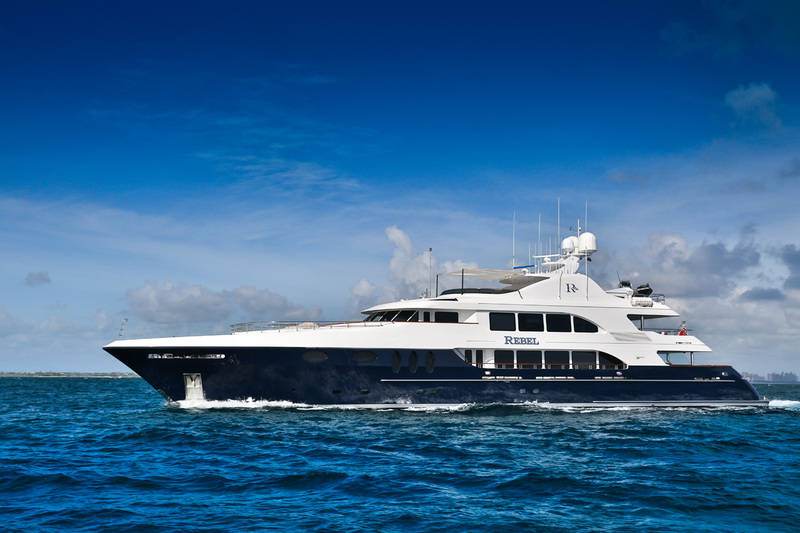 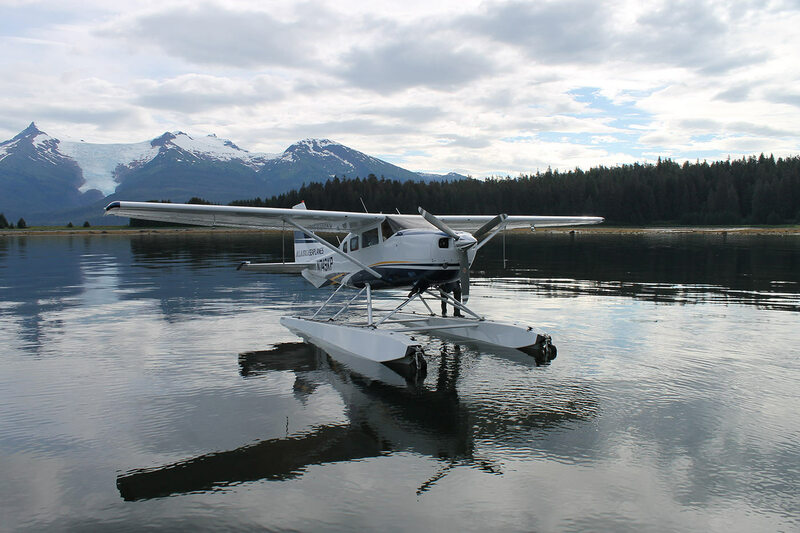 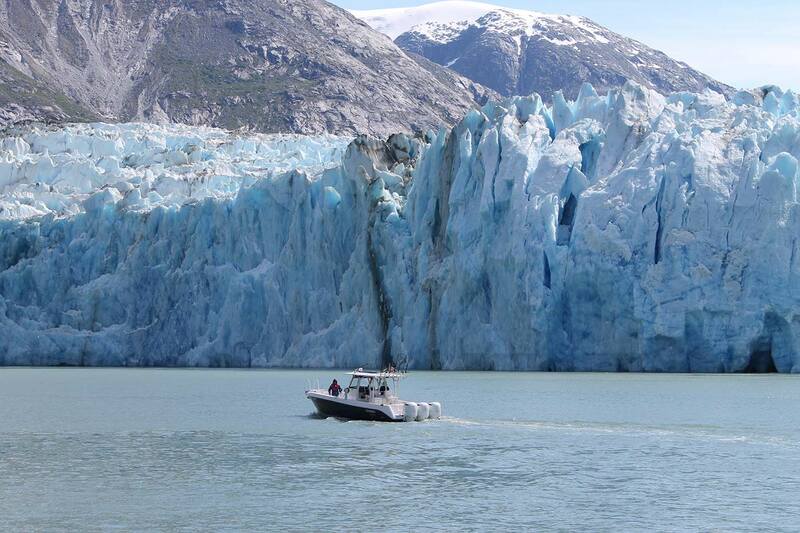 Powered by 2 x CAT 2250hp engines, she cruises at 14 knots and can reach top speeds of 20 knots. 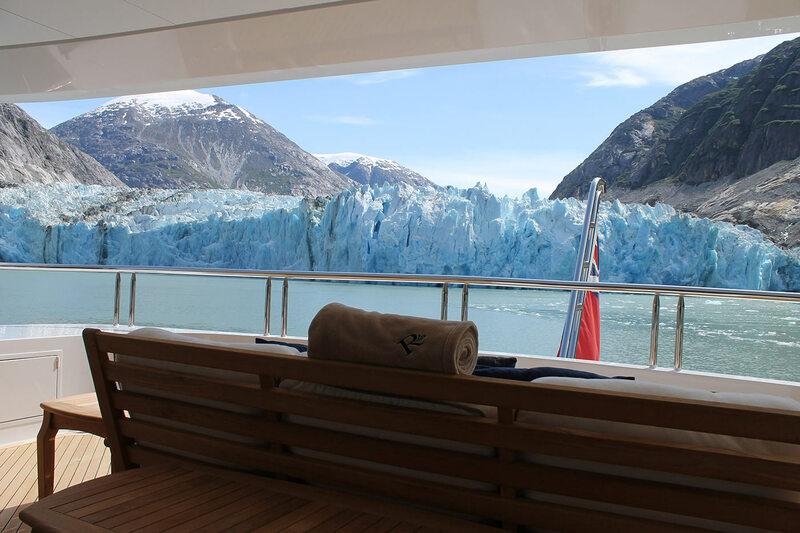 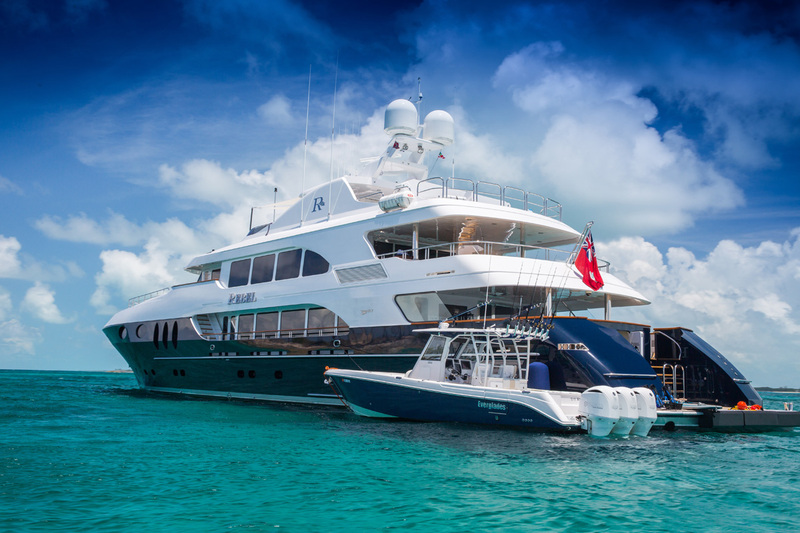 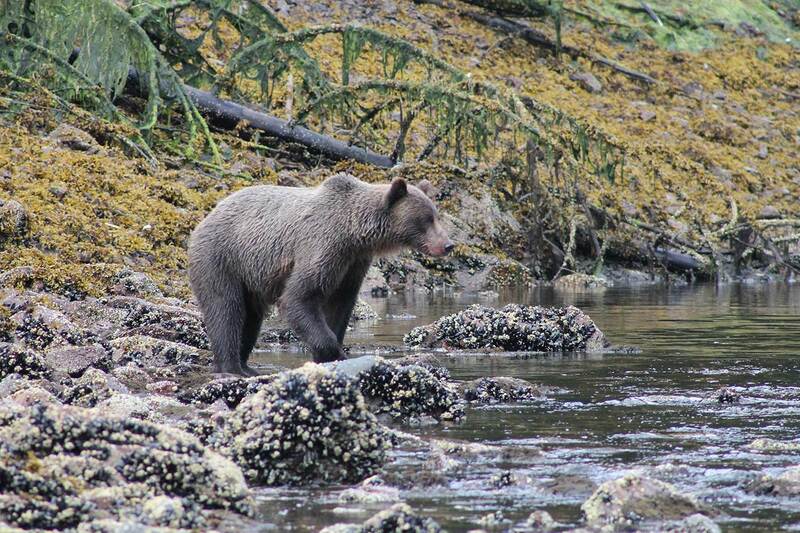 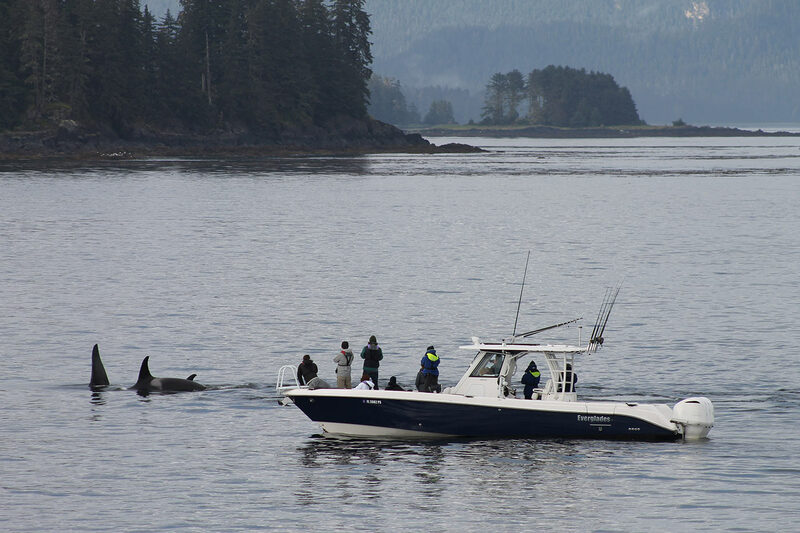 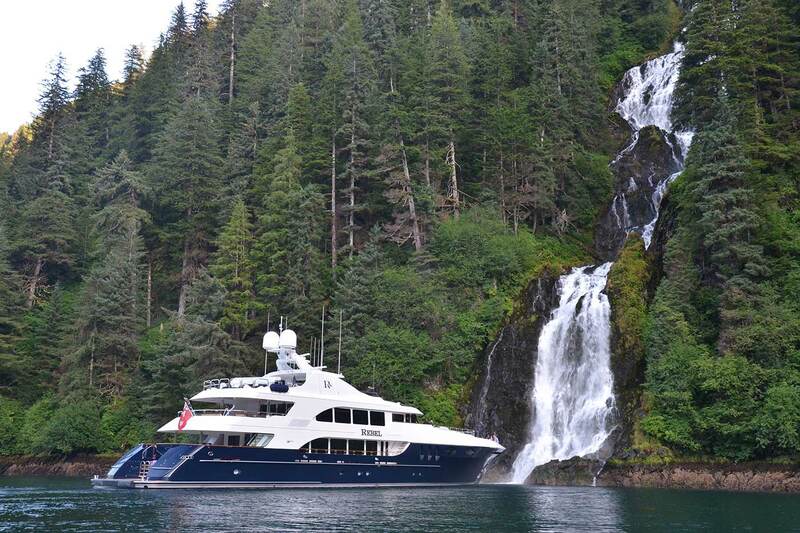 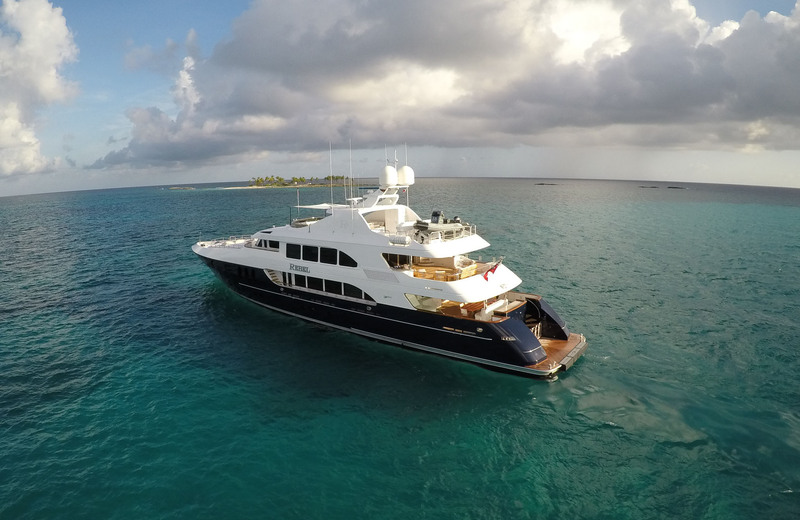 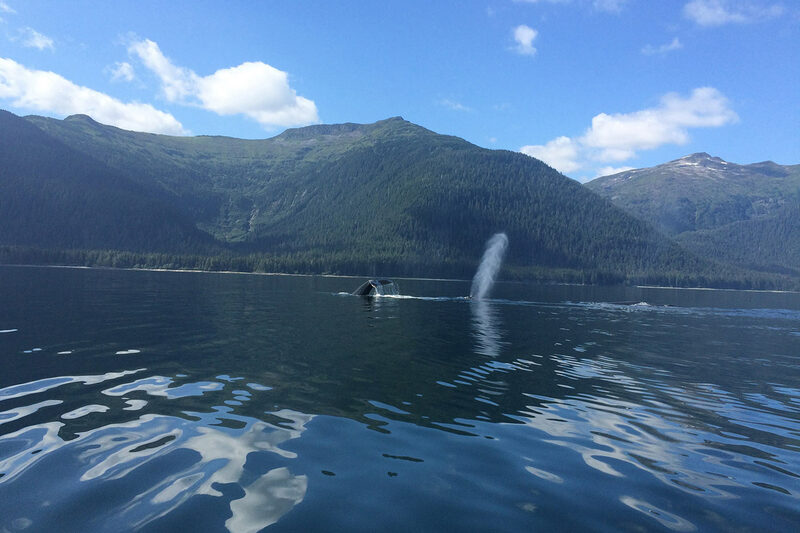 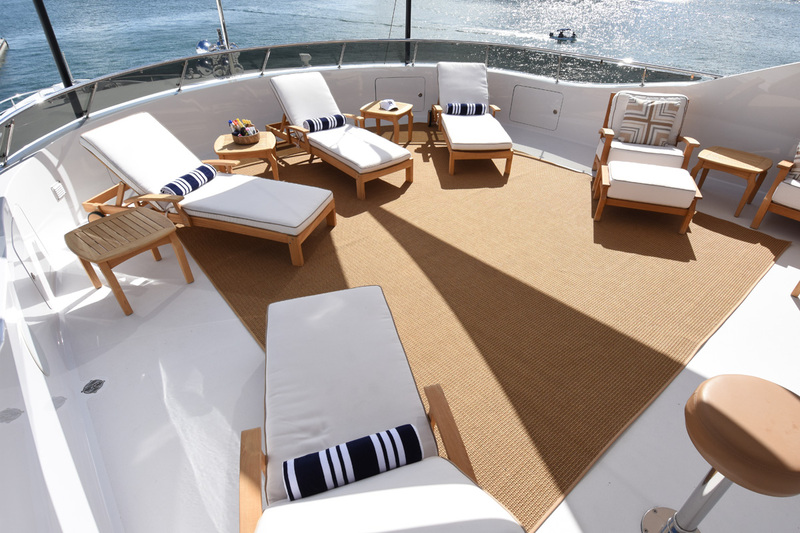 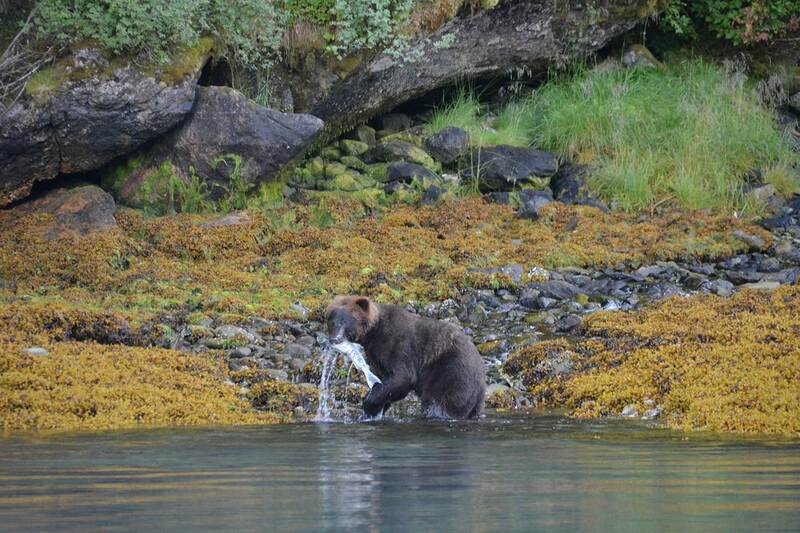 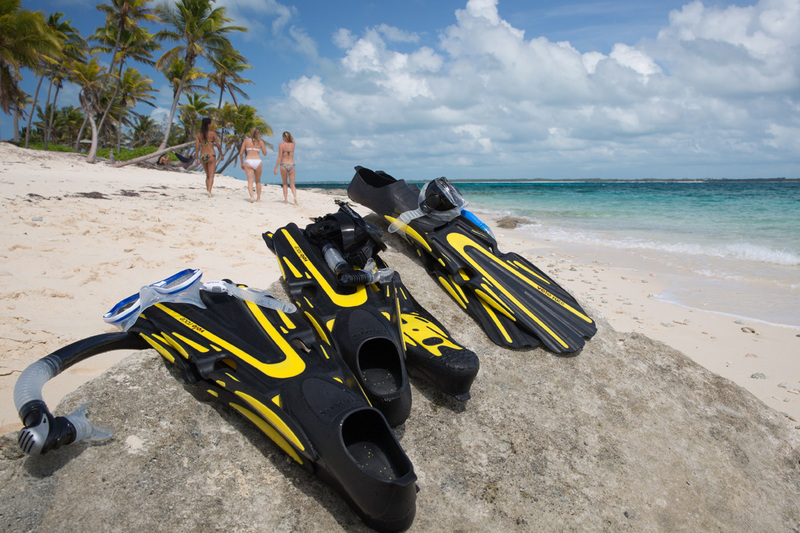 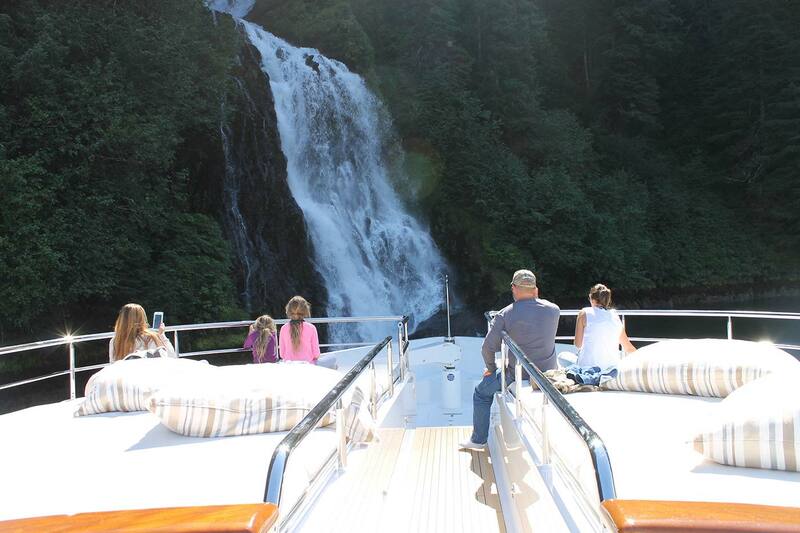 Fitted with at anchor and underway stabilizers, M/Y REBEL ensures optimum comfort. 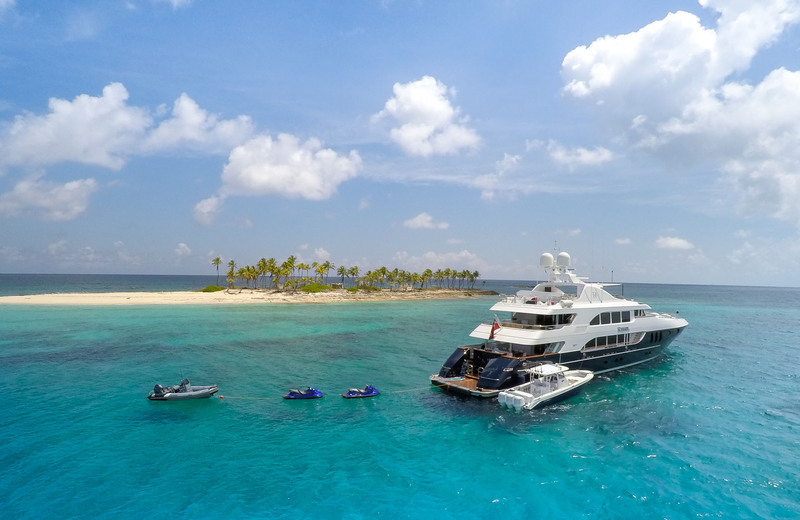 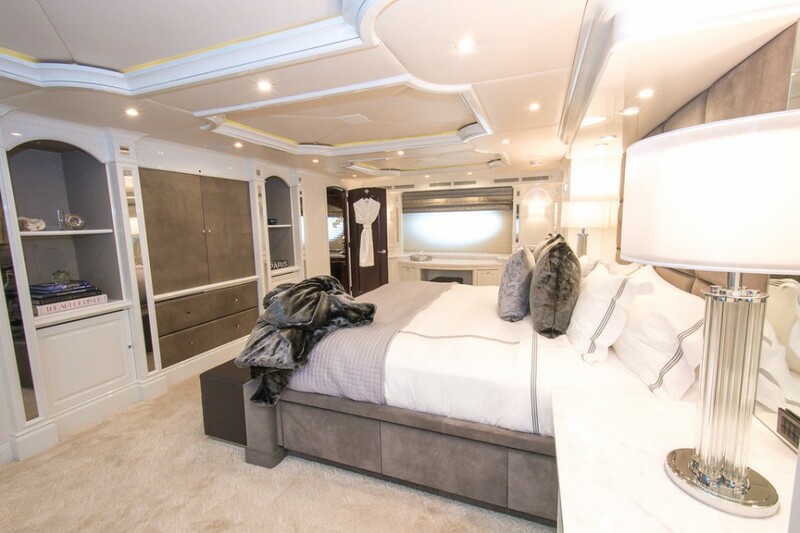 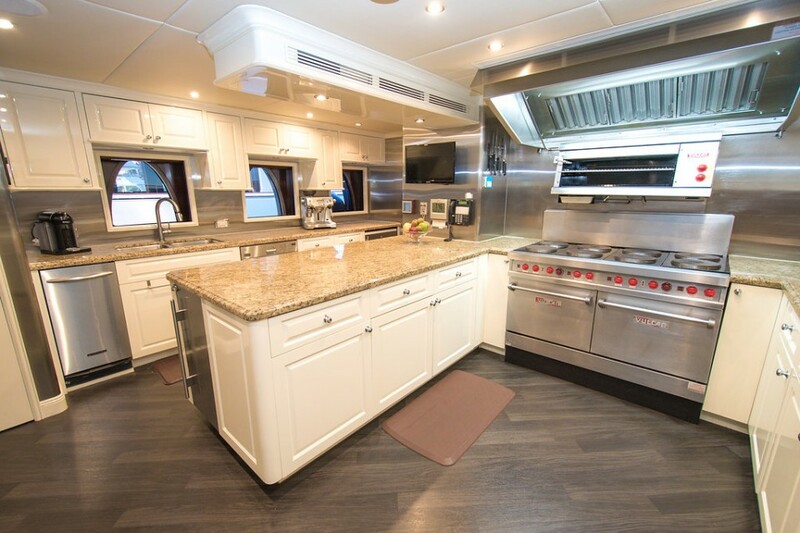 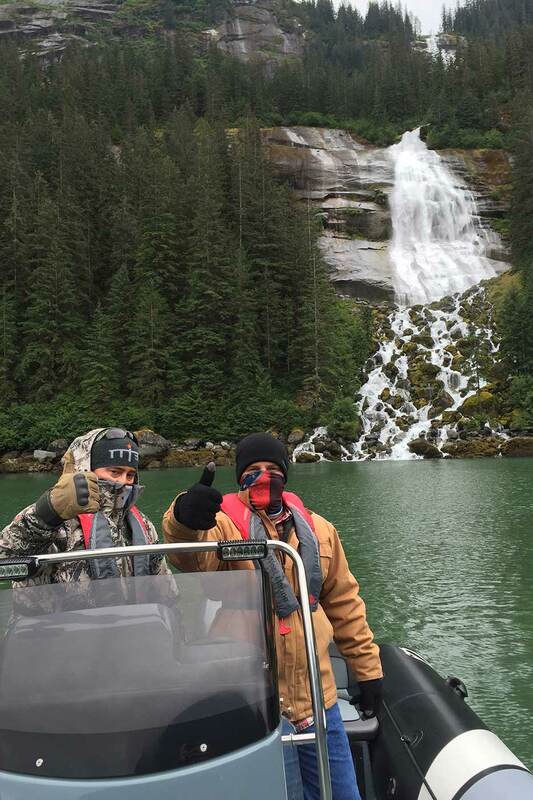 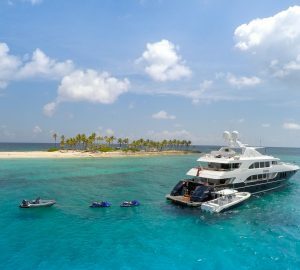 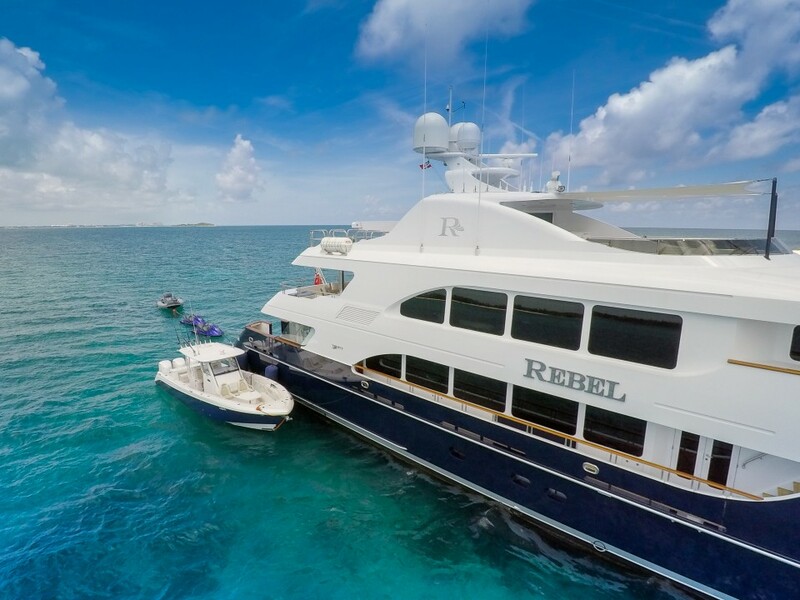 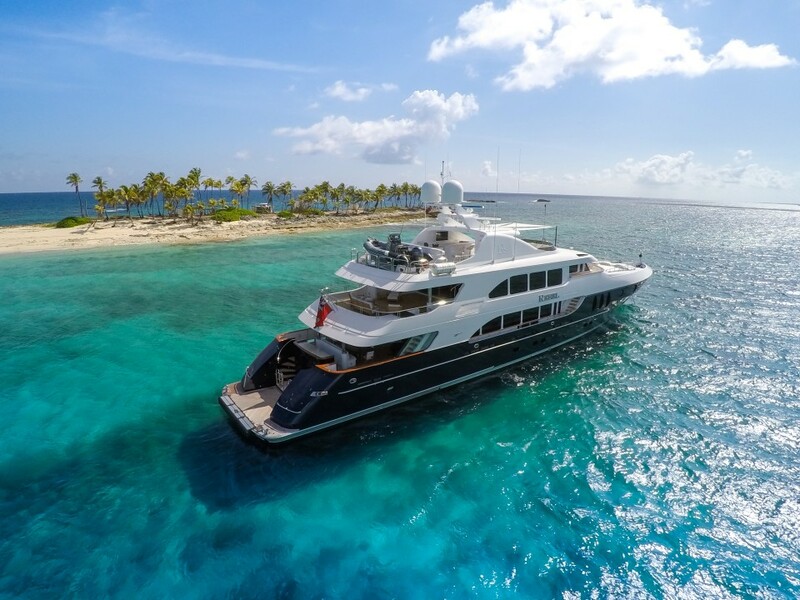 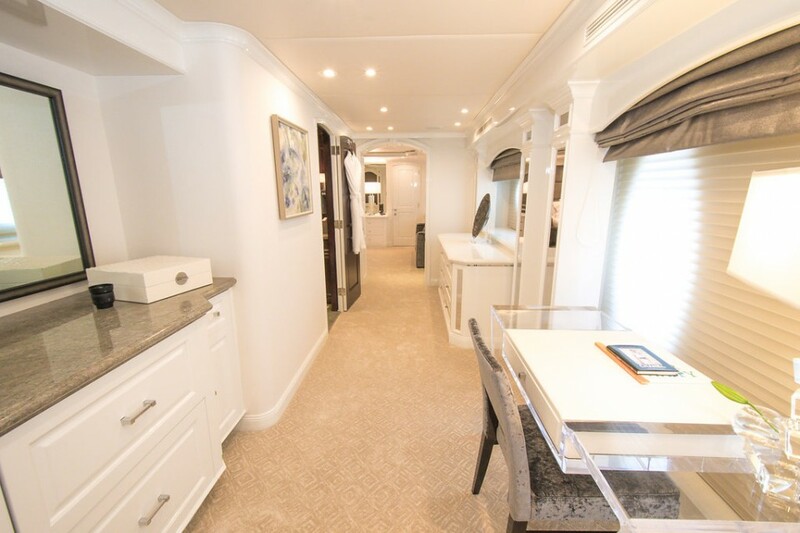 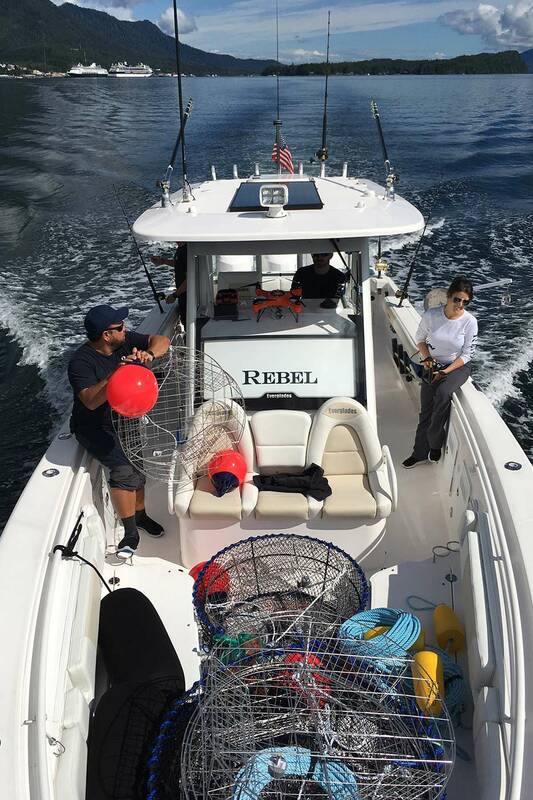 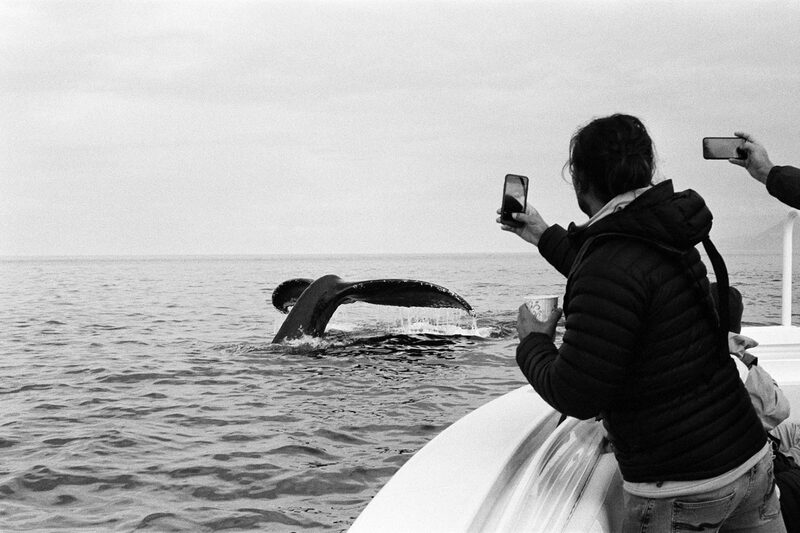 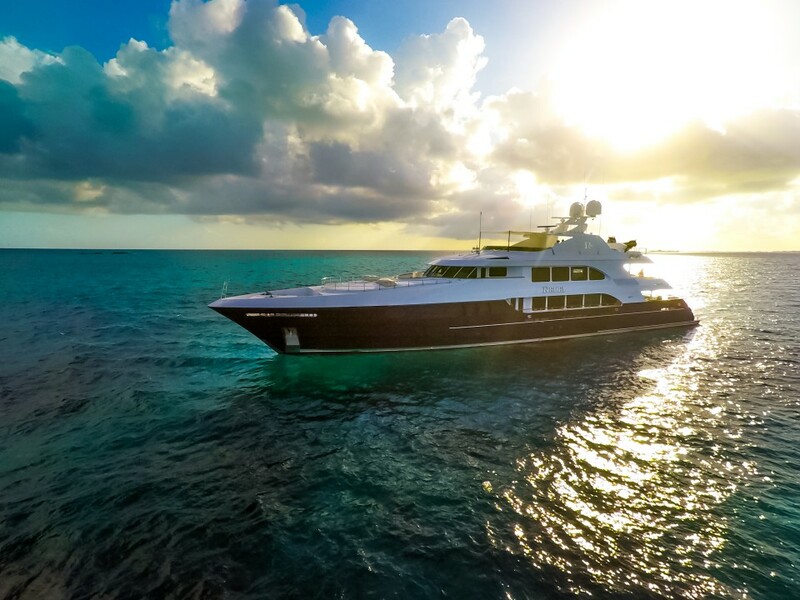 Luxury motor yacht REBEL provides yacht charter accommodation for up to 10 guests in the following format: Master Stateroom: On deck/Full Beam: King bed; ensuite His/Her bath w/ Spa Pool tub & large shower. 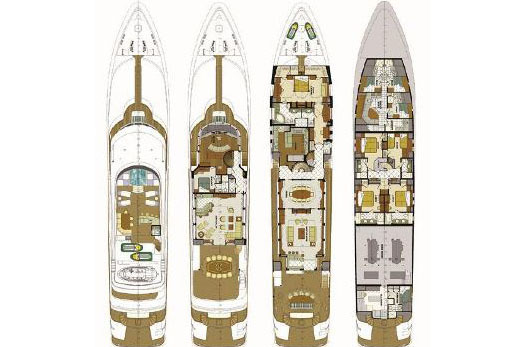 DVD/VCR/CD/AM-FM Stereo. 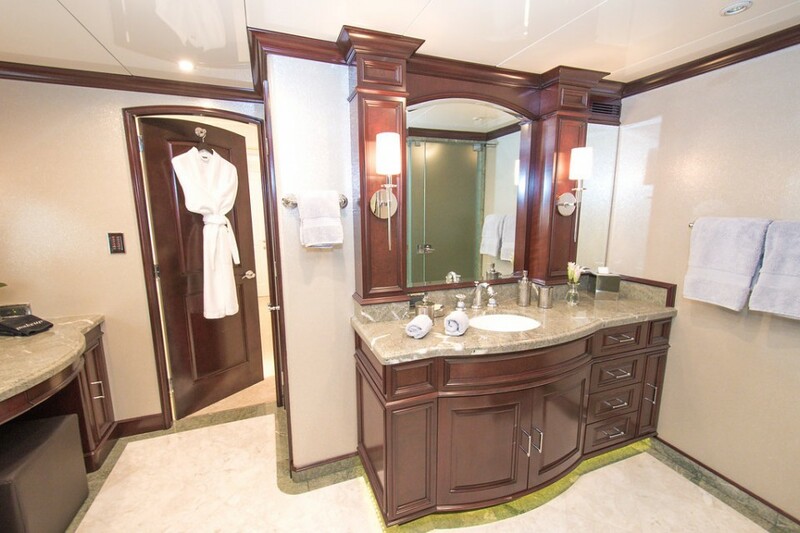 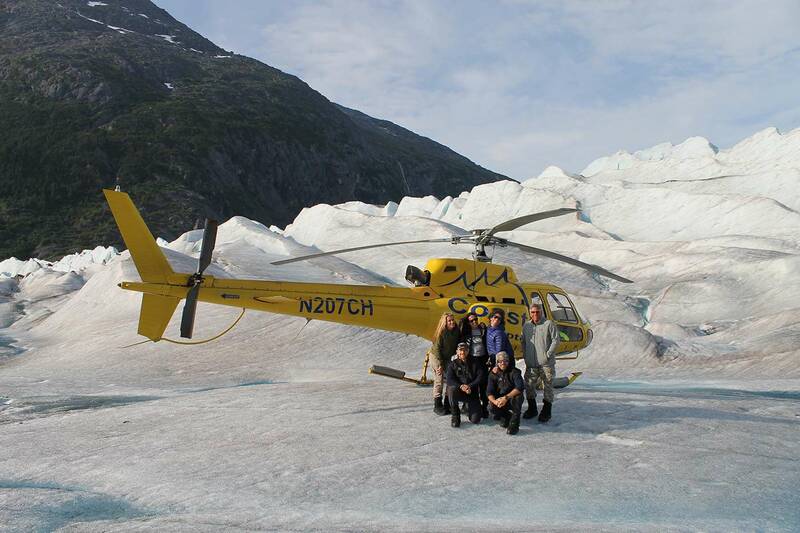 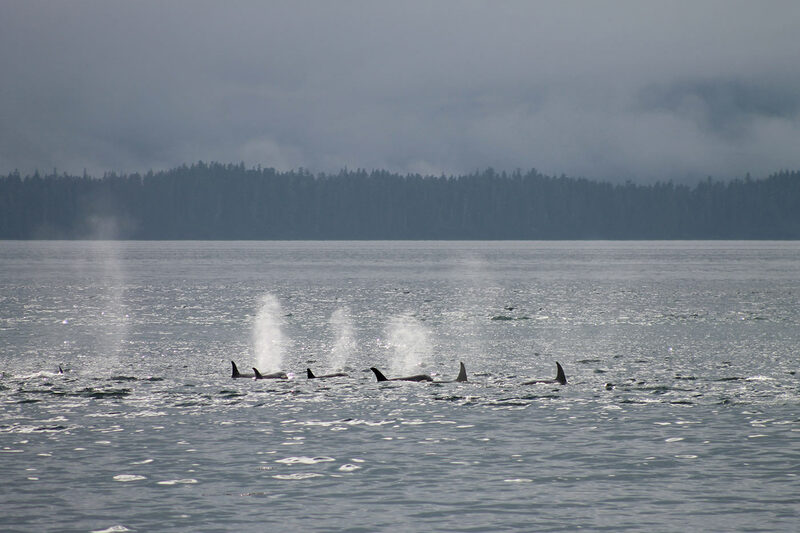 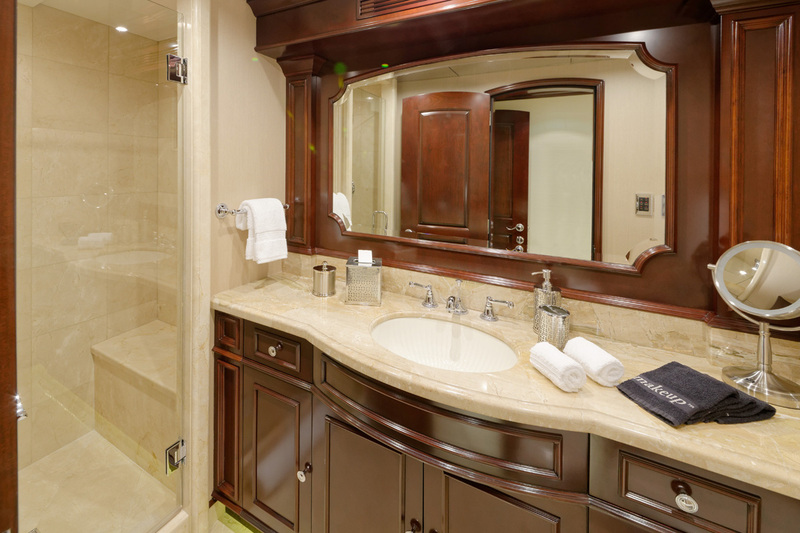 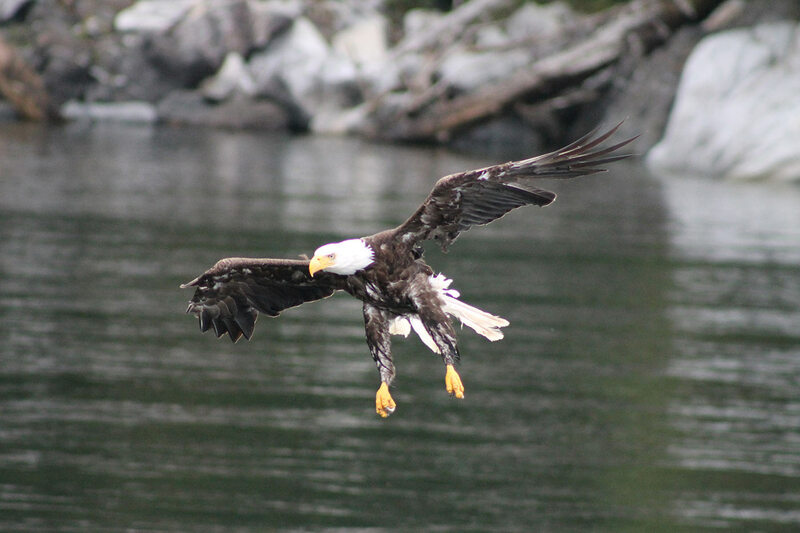 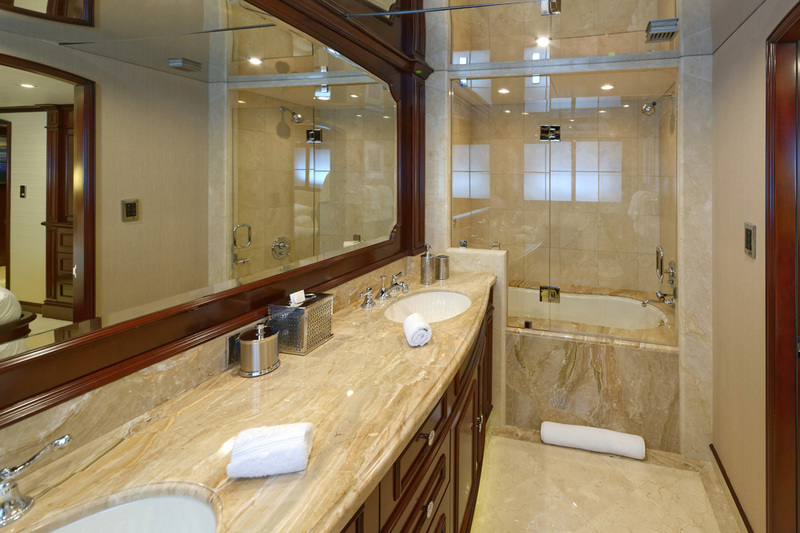 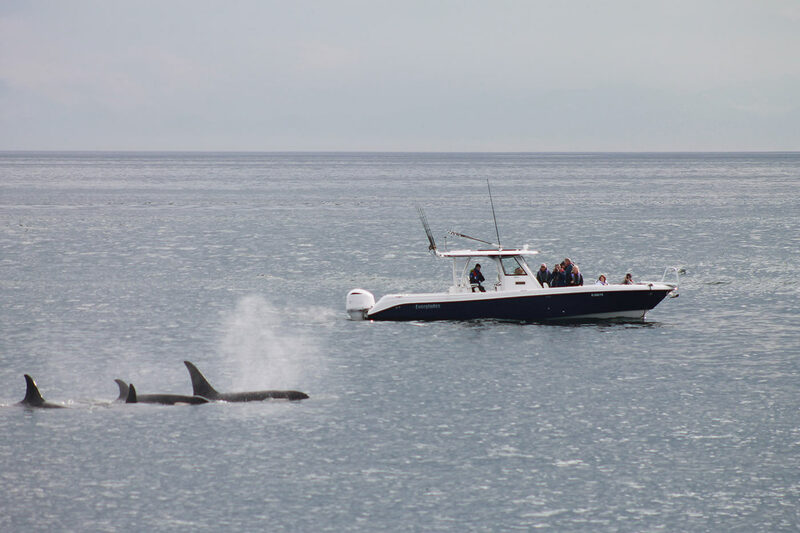 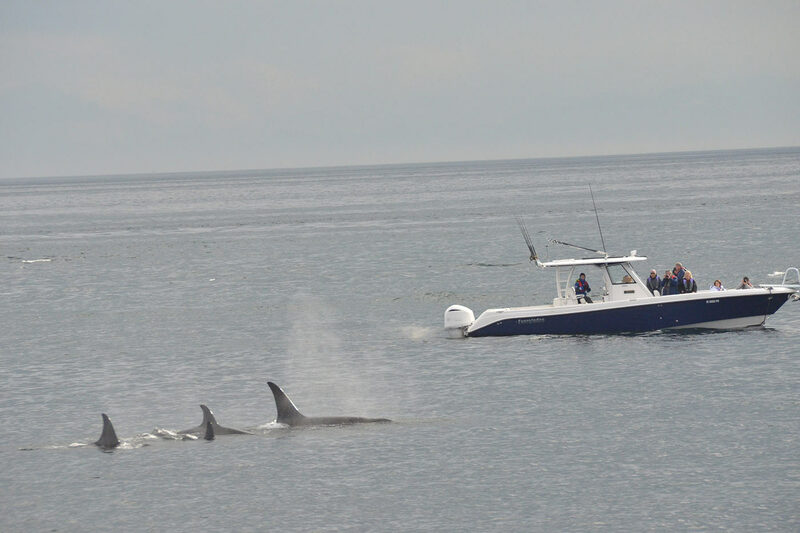 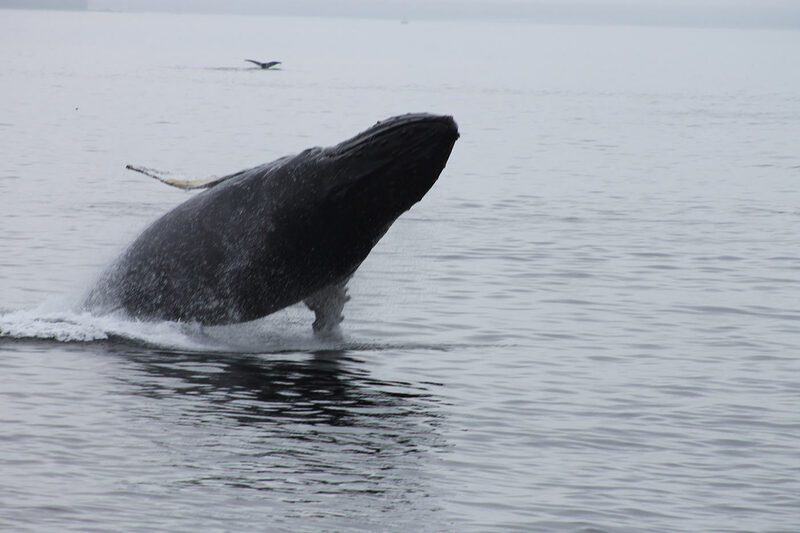 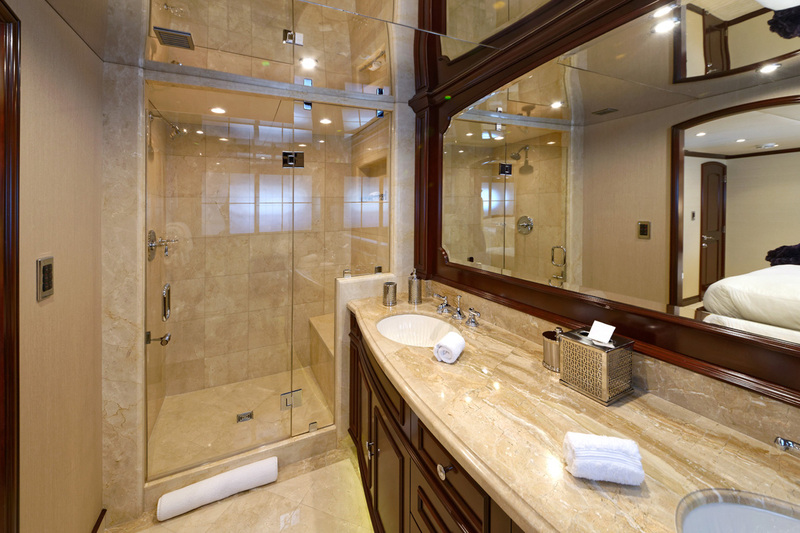 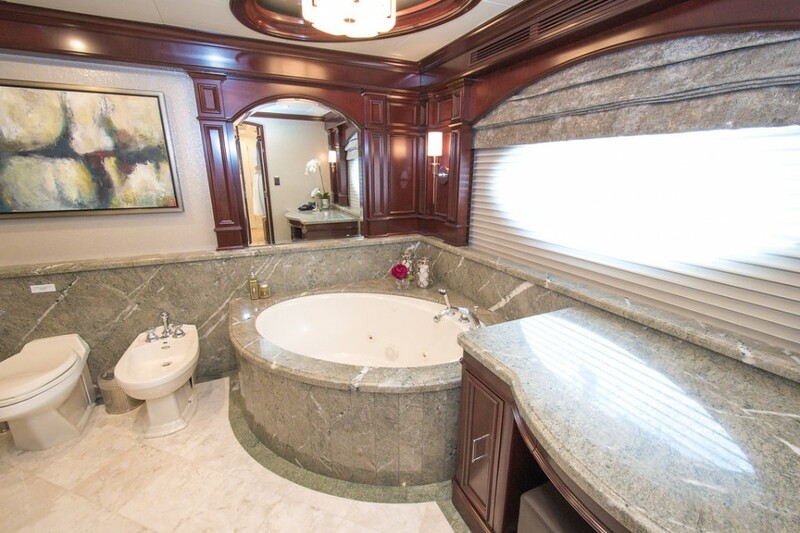 Guest stateroom: Below Amidship Aft Stbd: King bed, ensuite bath w/ tub & shower. 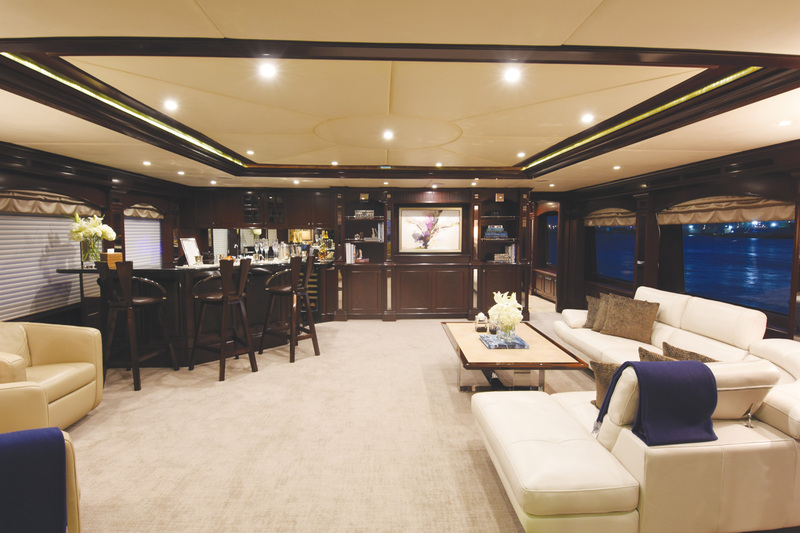 TV/DVD/VCR/CD/AM-FM Stereo. 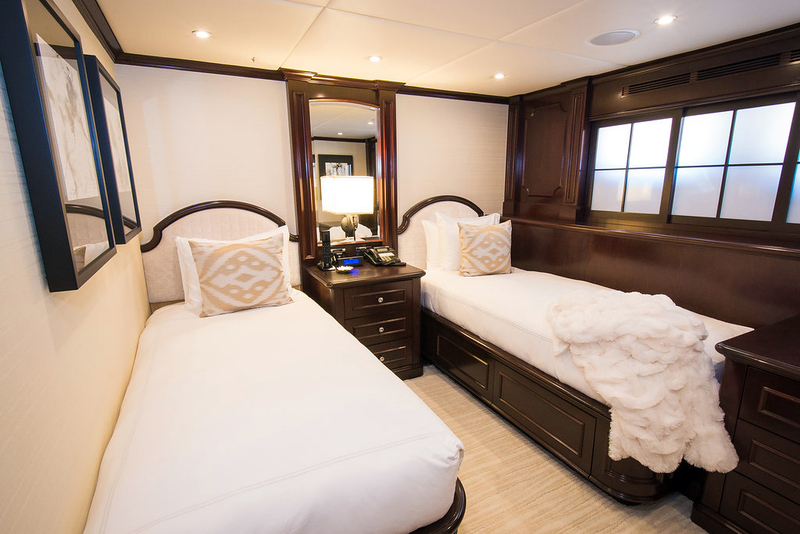 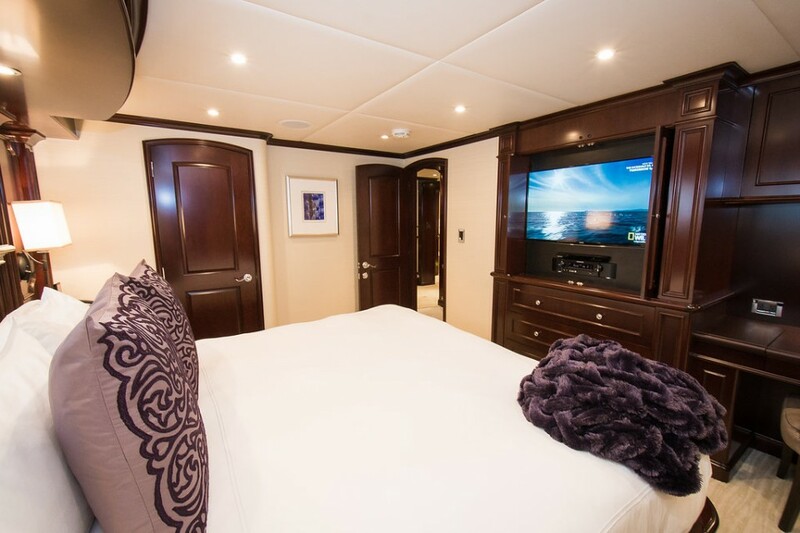 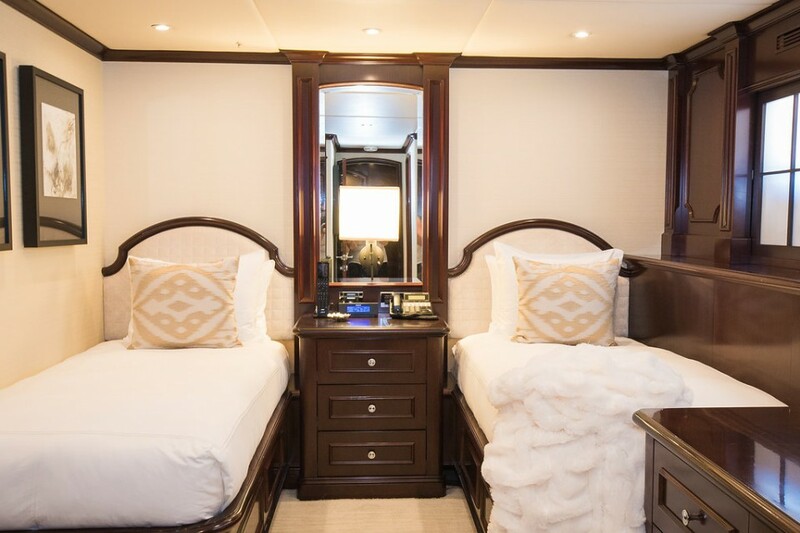 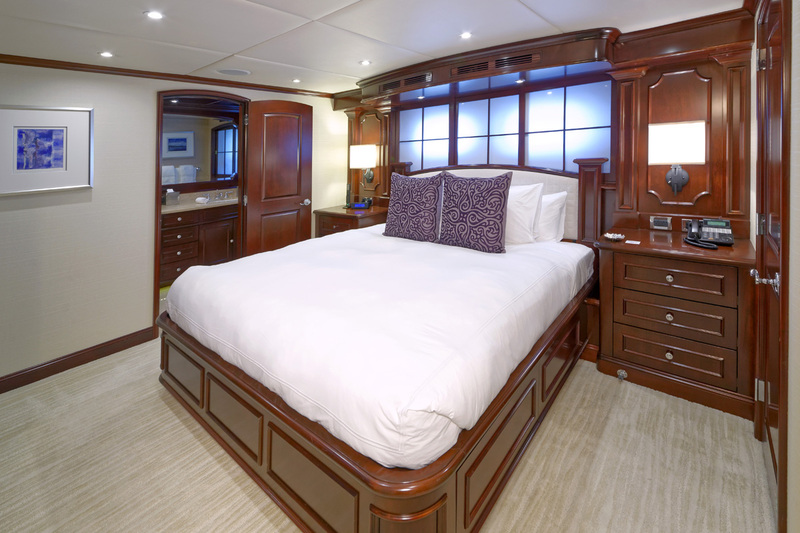 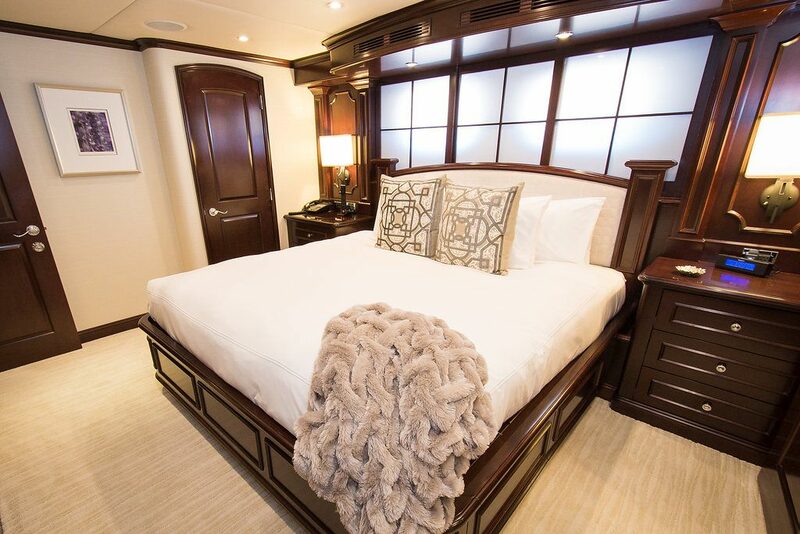 Guest stateroom: Below Amidship Aft Port: King bed, ensuite bath w/ shower. TV/DVD/VCR/CD/AM-FM Stereo. 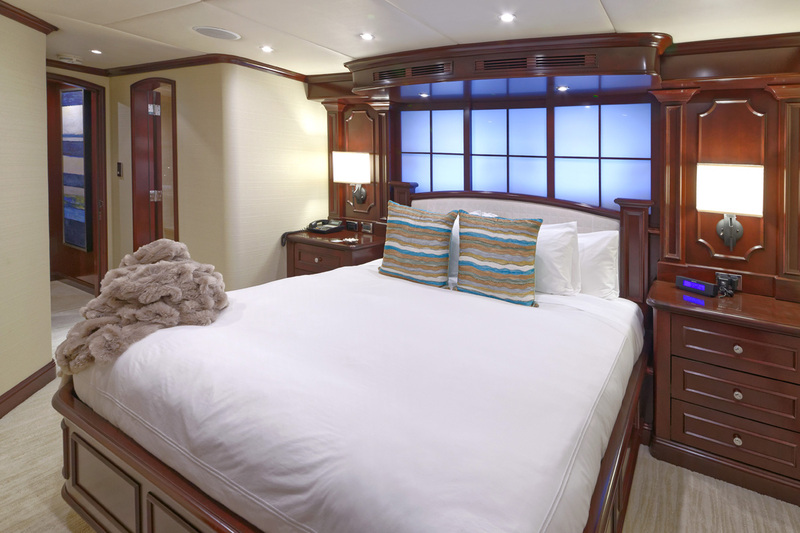 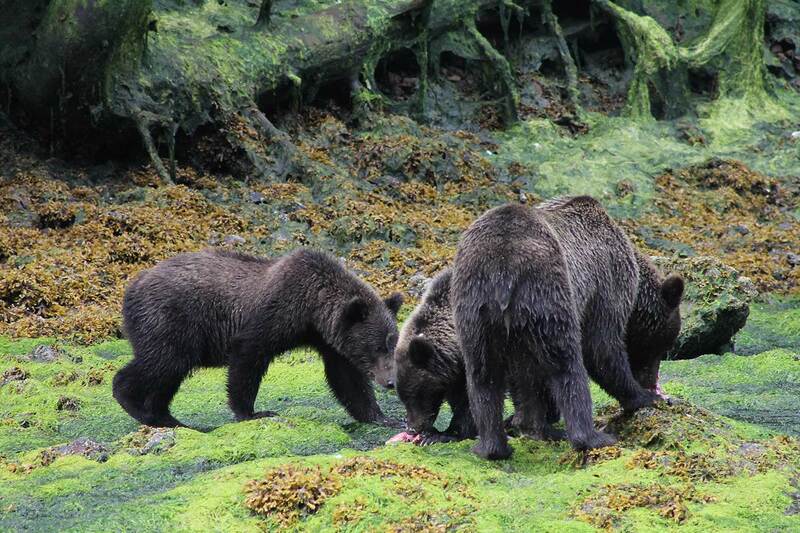 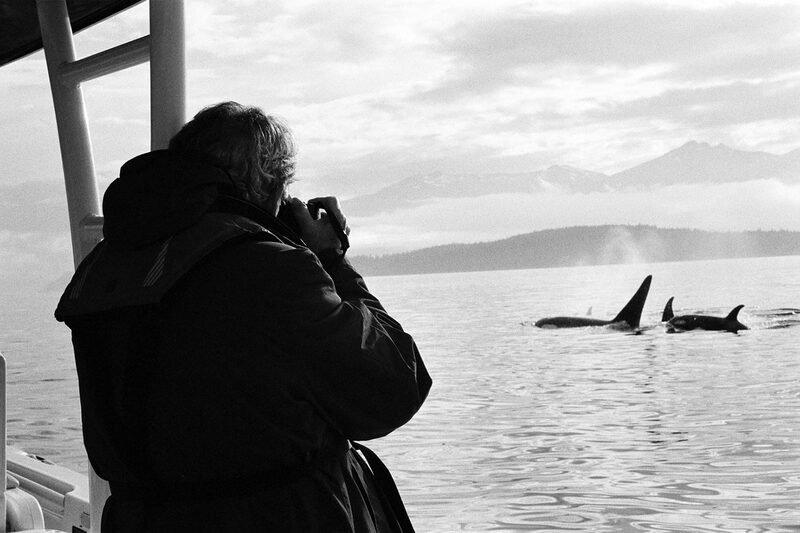 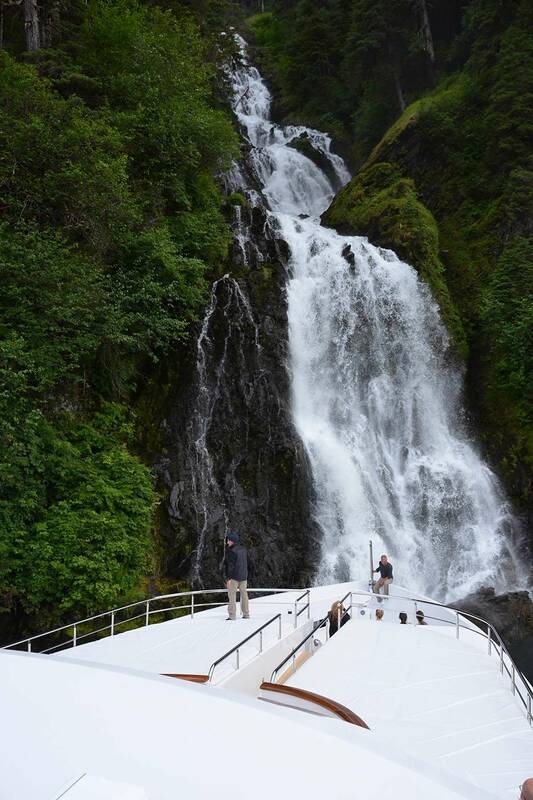 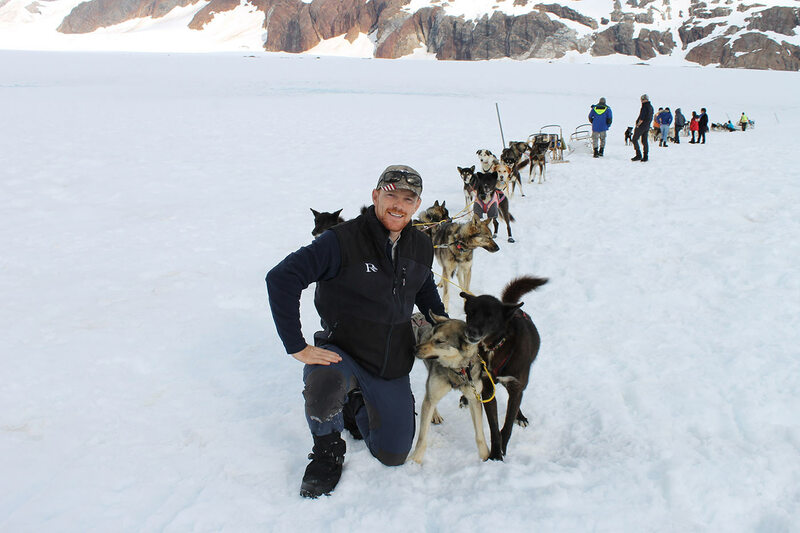 Guest stateroom: Below Amidship Forward Stbd: Twin bed w/ Pullman (80 lb. 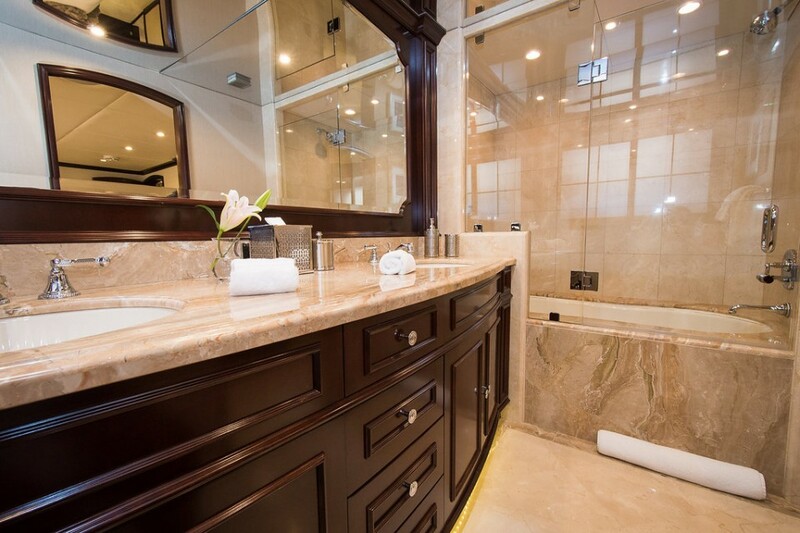 max) ensuite bath w/ shower. 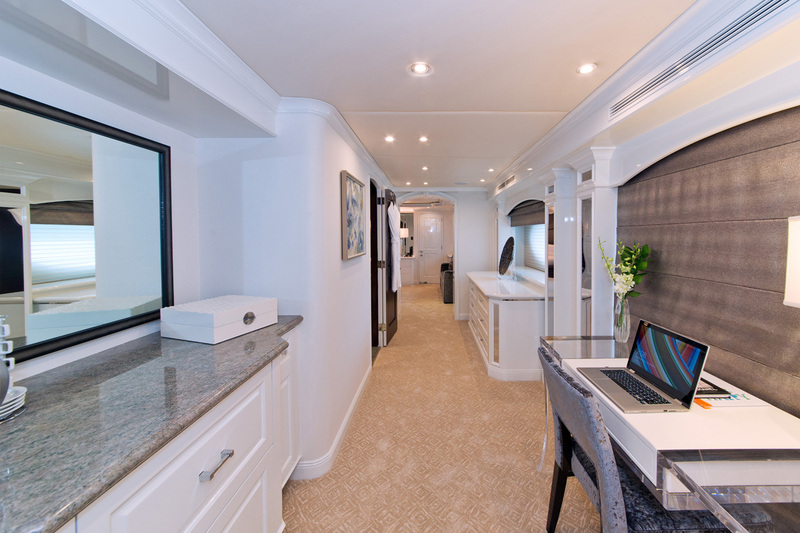 TV/DVD/VCR/CD/AM-FM Stereo. 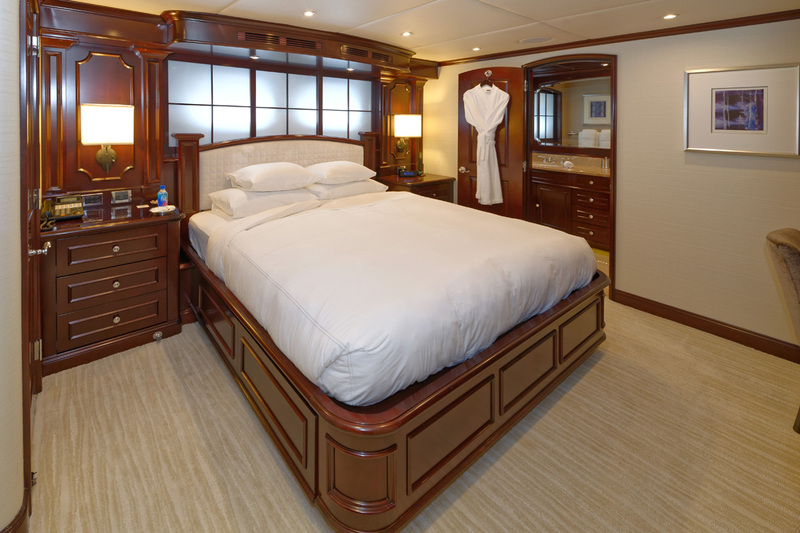 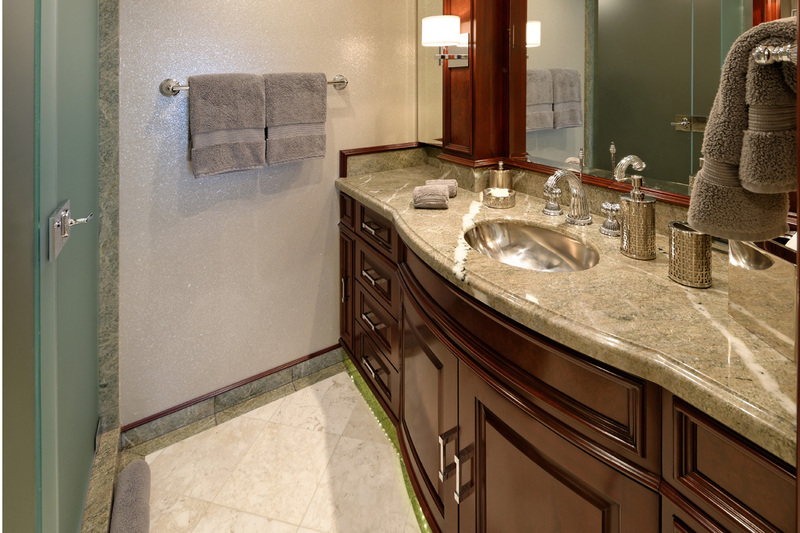 Guest Stateroom: Below Amidship Forward Port: King bed, ensuite bath w/ shower. 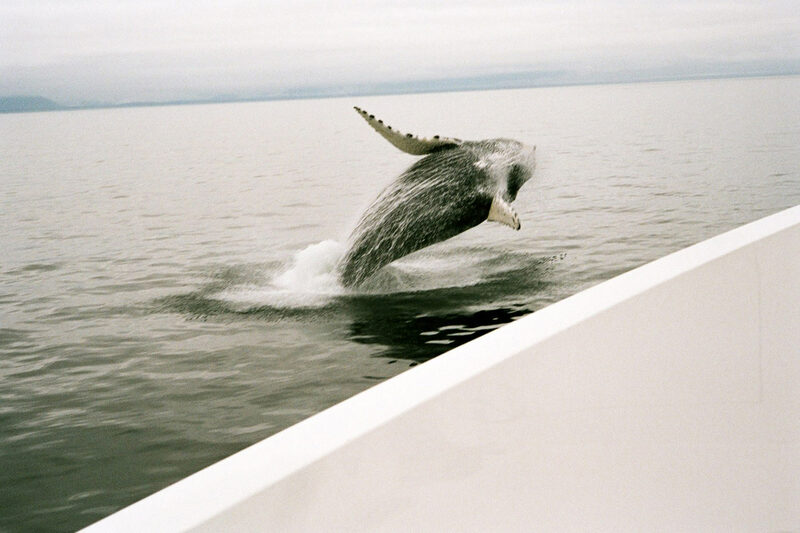 TV/DVD/VCR/CD/AM-FM Stereo. 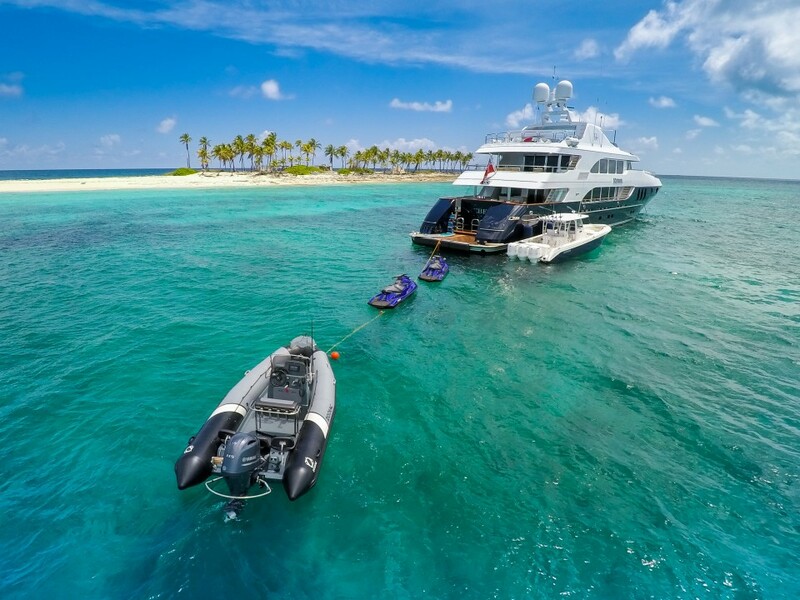 Luxury motor yacht REBEL offers the following water toys and amenities for your luxury yacht charter vacation: Tenders & Toys Tender: 32’ Intrepid towed tender 18’ Nautica w/ 115hp Yamaha 2 stroke engine 2 x 250hp Yamaha engines 2 x 3 person Sea Doos Jetskiis 2 x 2 person Yamaha waverunners Boogie Board Water skiis-Kids/Adults/Professional Fishing Equipment-Kids & Professional 12 sets x Snorkel gear 2 x 6 man banana Misc. 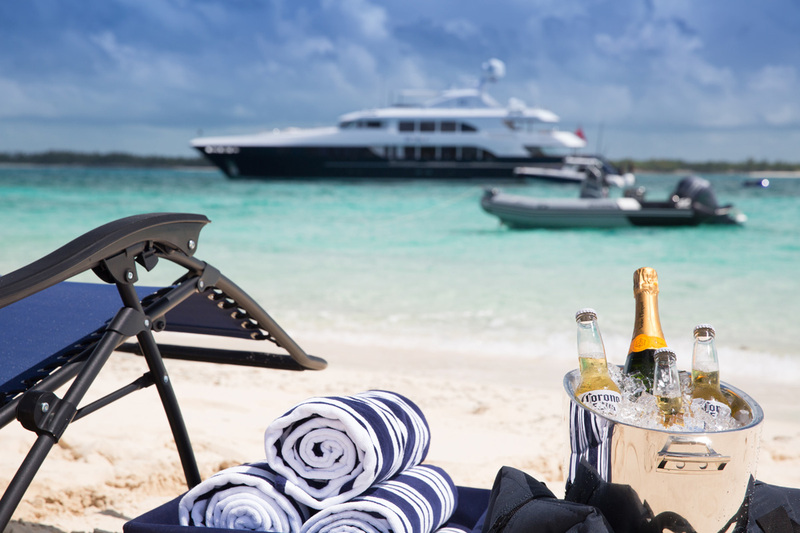 Beach Toys: umbrellas, beach chairs, footballs, volleyballs Exercise Equipment: Dumbbells & step master. 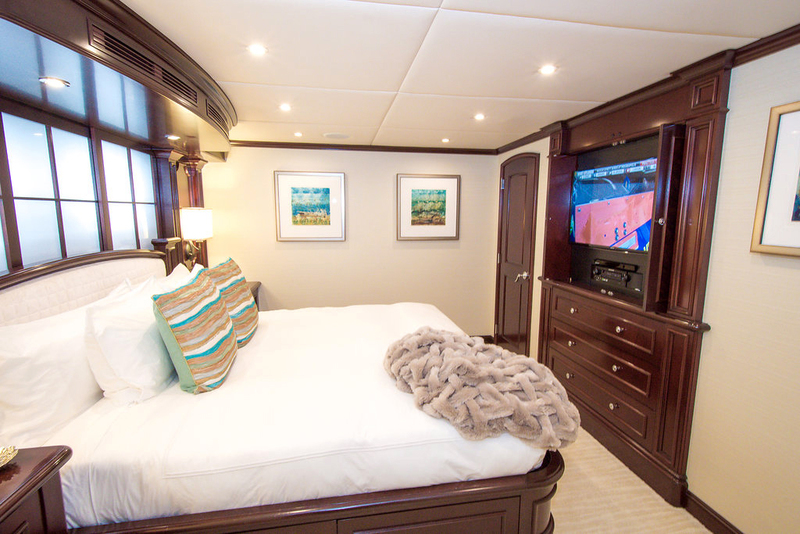 Audio Visual Equipment and Deck Facilities ENTERTAINMENT Satellite TV- DVD libraries CD player. 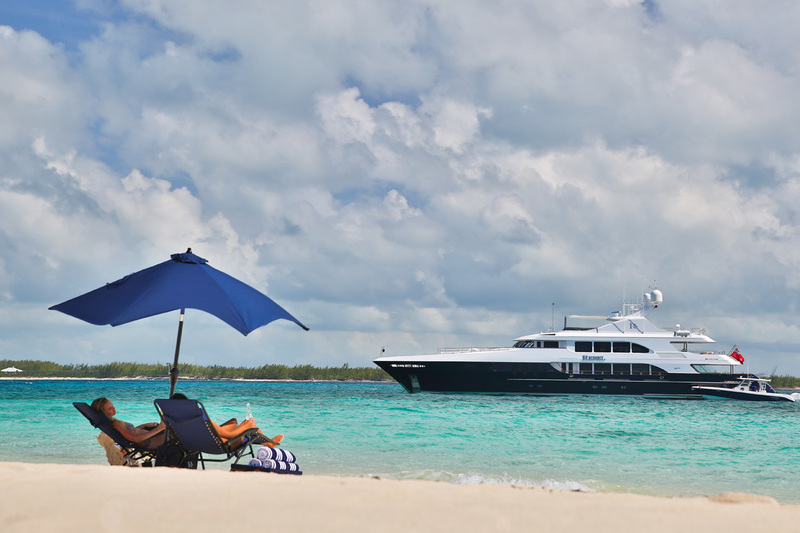 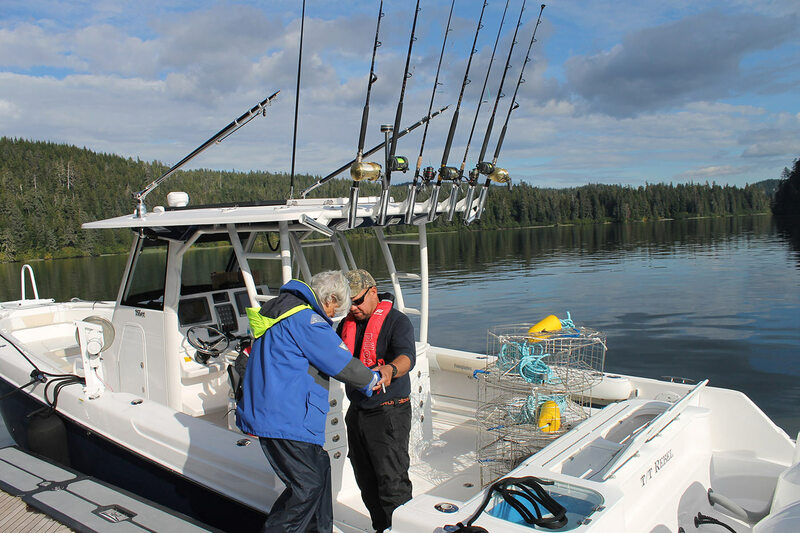 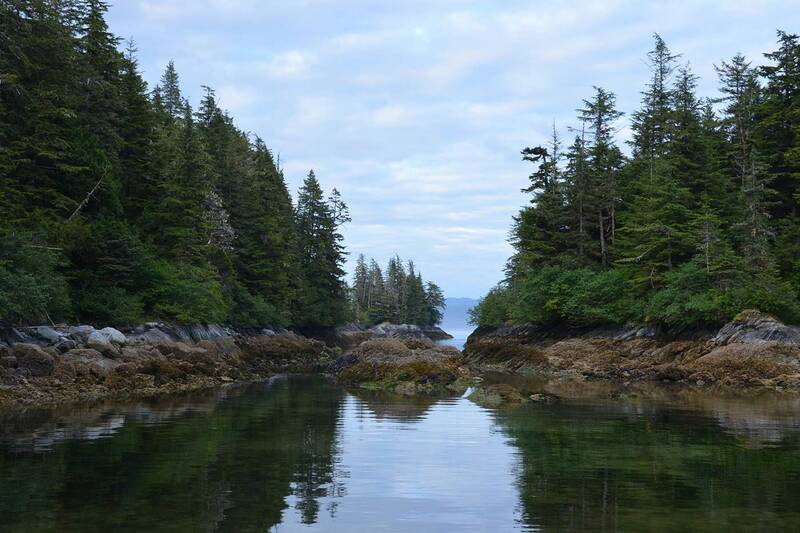 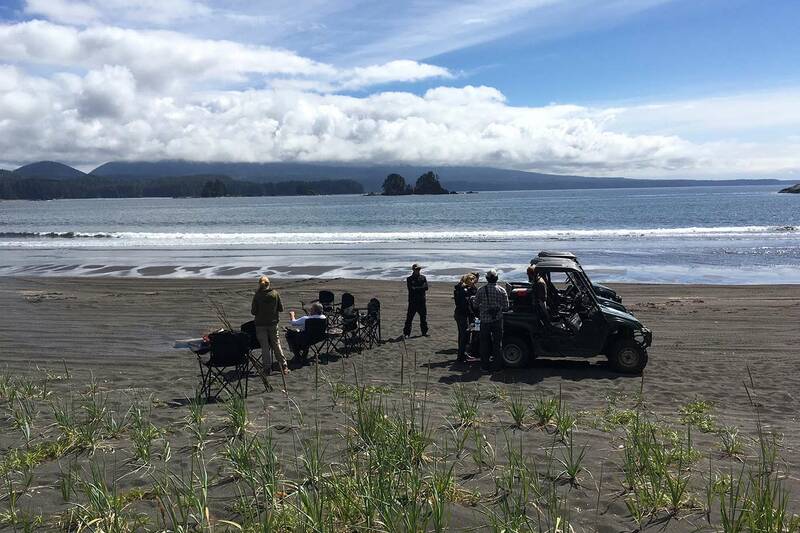 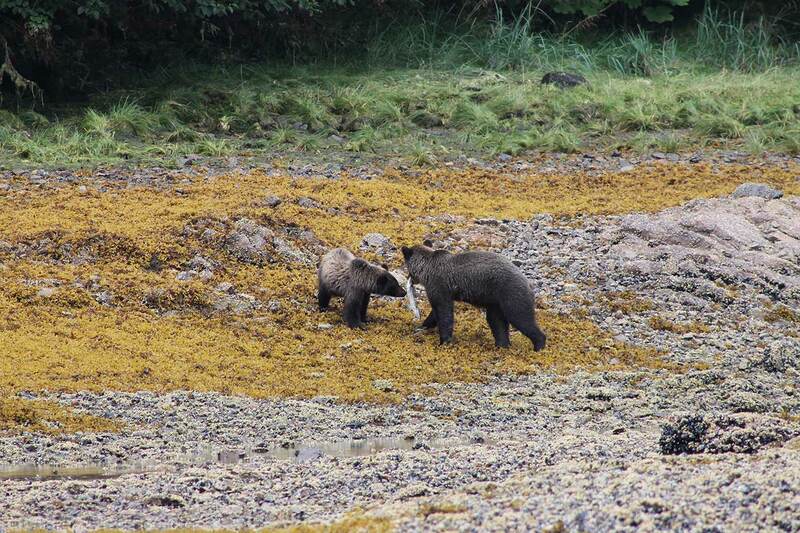 Communications ALL Satellite & Cellular Communications throughout, shore line. 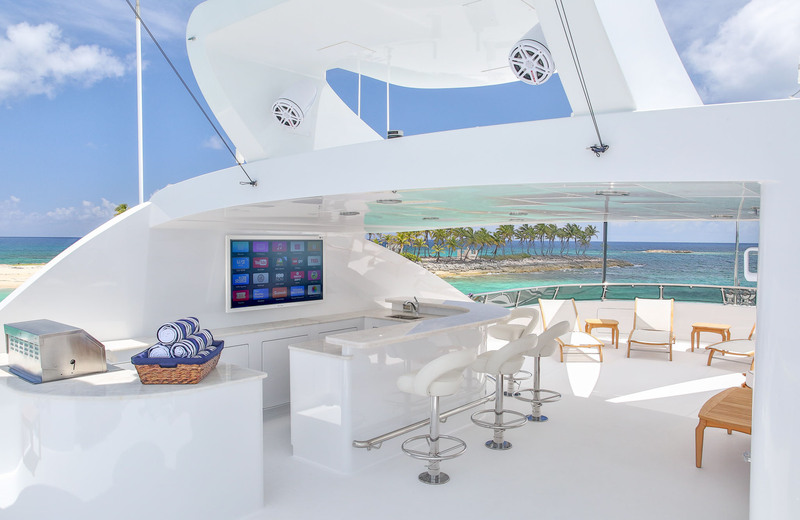 V SAT High speed internet throughout.